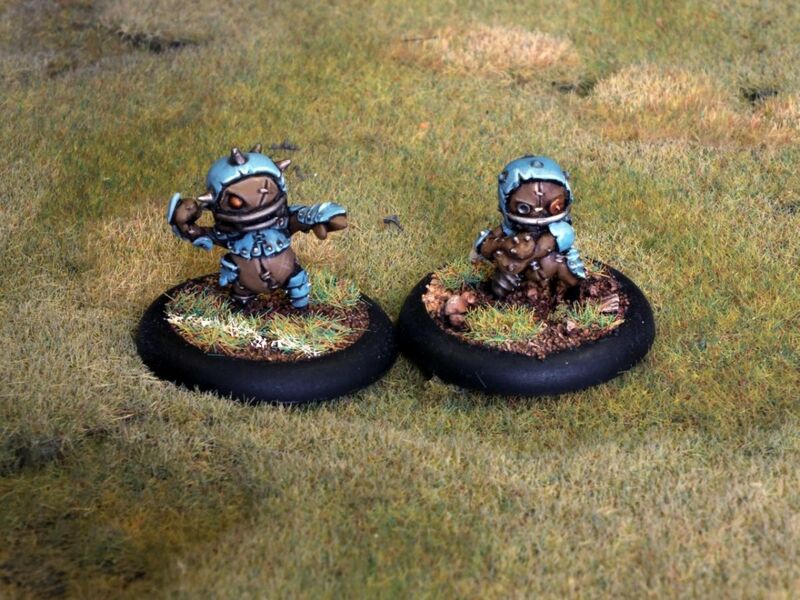 These models were painted by the talented team of Dan Twiss and Kate Evans (of whom the latter now has her own studio) and are painted in the colours of the older spurs away kit/very light pale blue (whichever is closer). 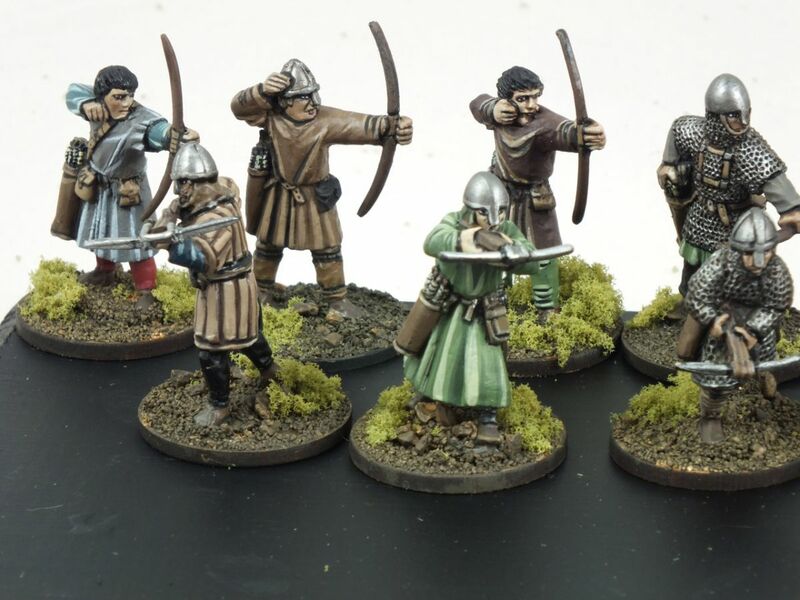 They are available directly from the Tor Gaming webstore, see here, and you can pick up the entire team of 14 for £35 + shipping. 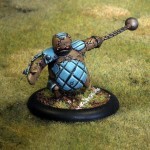 A steal really for 14 well sculpted and cast metal miniatures including that huge Golem. 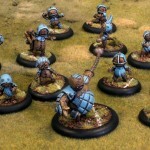 The rules themselves for the Relics Armistice League continue to be developed (you can find more here) there’s no reason why you can’t use these within any other Fantasy Football game. 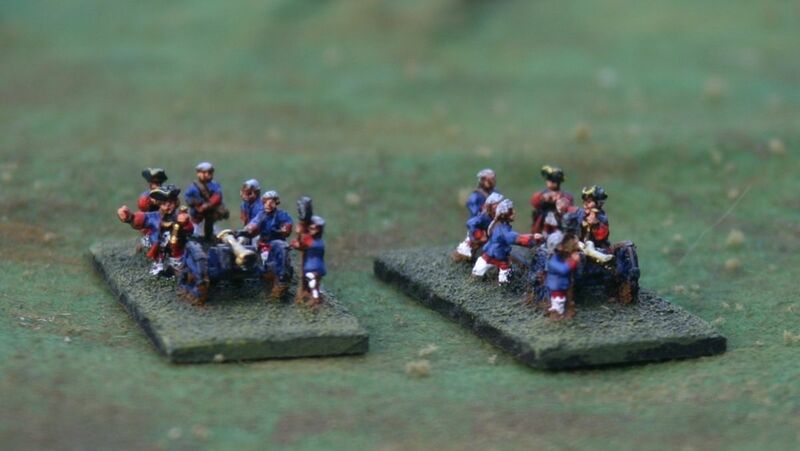 Sadly, the whistle has been blown. 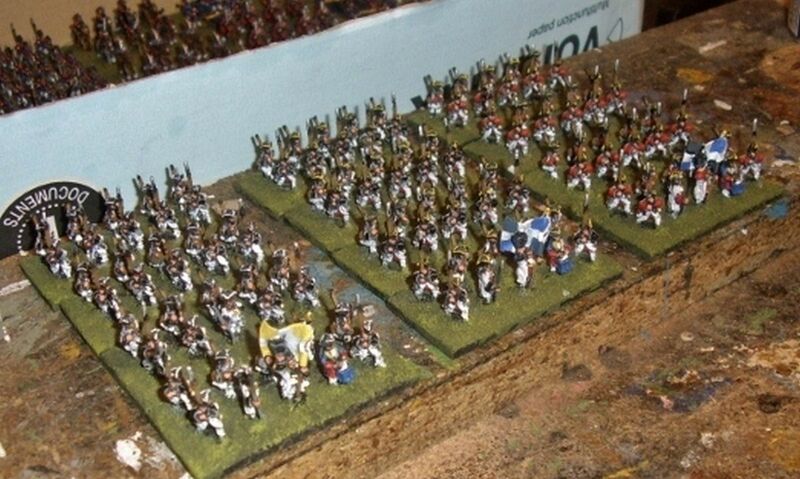 It’s time now for me to head home pondering this post…..
A spare few moments I have, and so another post I bring. 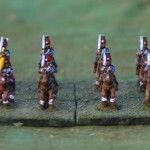 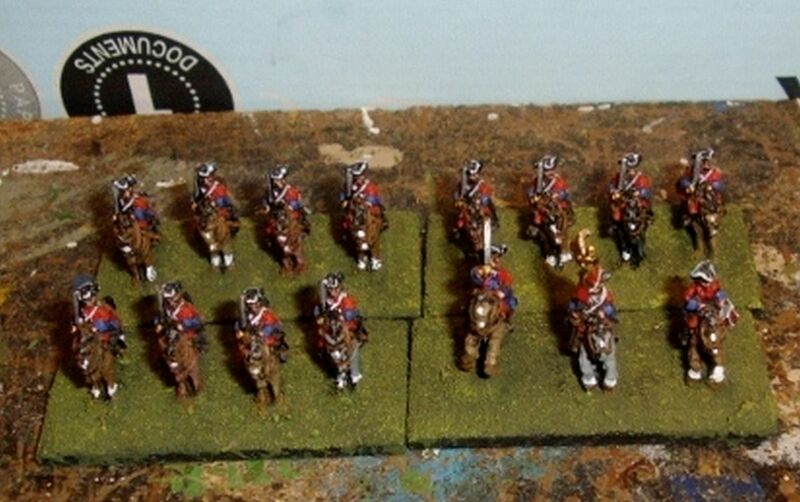 This time, my recently painted Perry Miniatures British Cavalry, depicted as the 16th (Queens) Regiment of Light Dragoons. 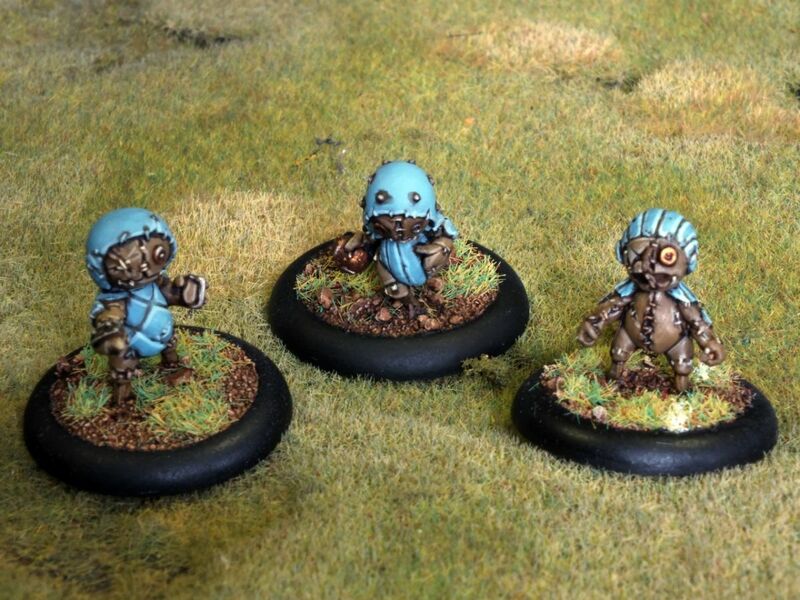 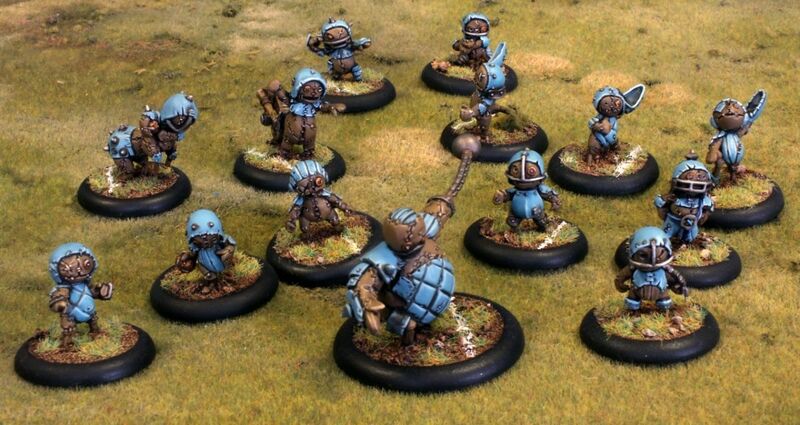 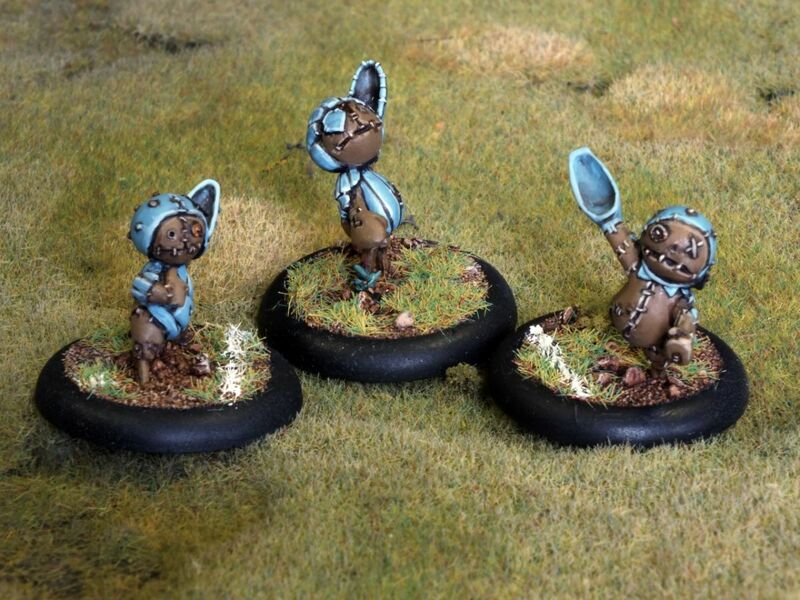 These chaps were painted by Artmaster Studio whom I use for all my Naps stuff as I love their style. 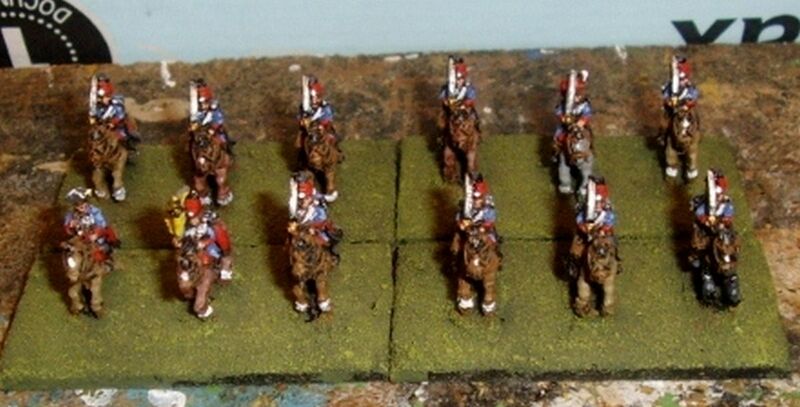 They’re not the cheapest but the end results justify the costs. 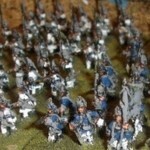 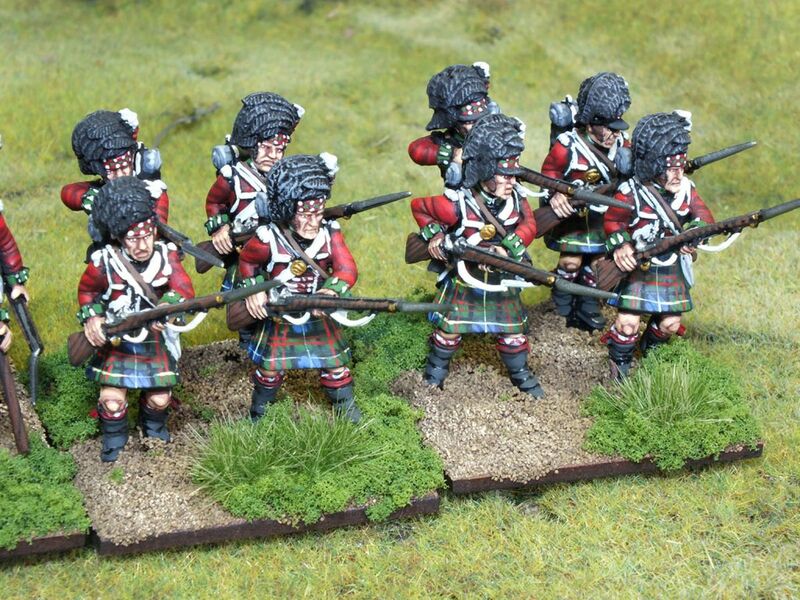 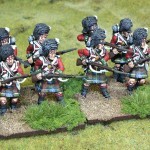 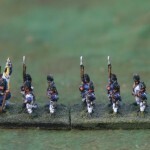 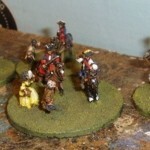 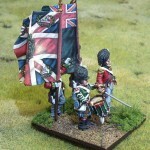 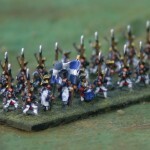 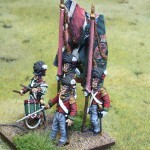 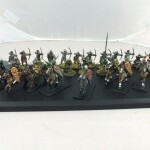 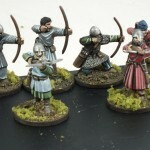 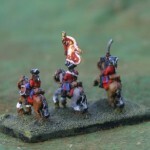 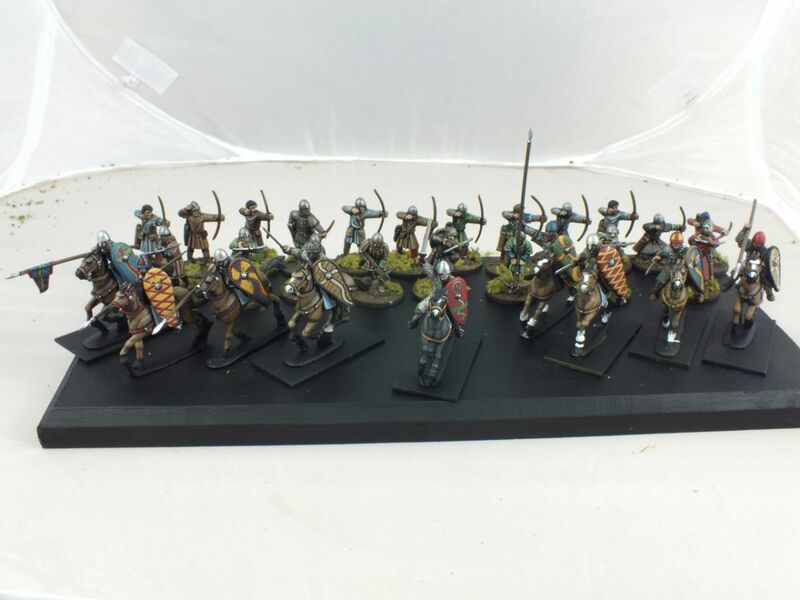 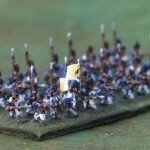 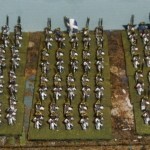 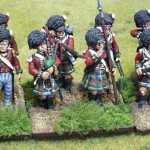 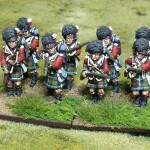 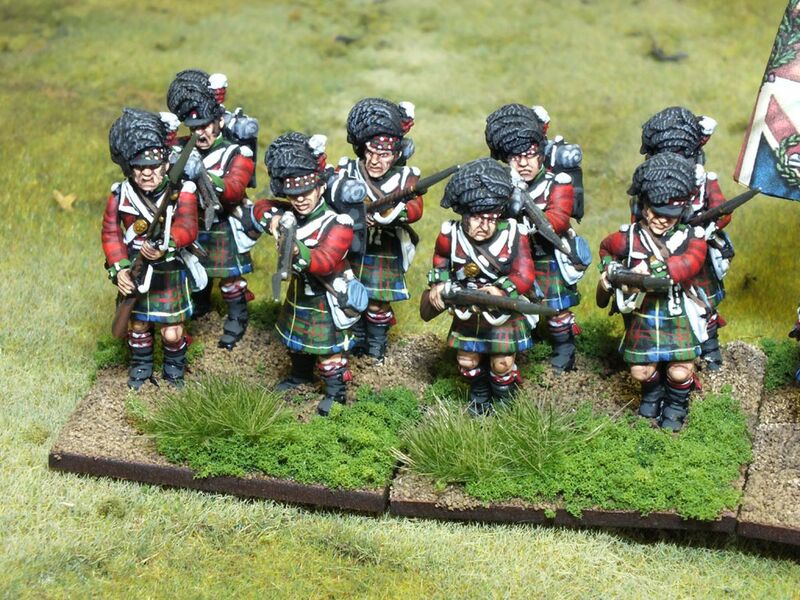 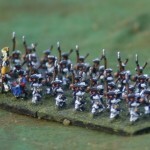 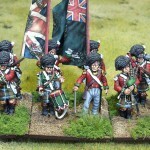 Recently I’ve posted the Highlander Battalion they painted up. 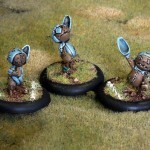 You can read/see more about that here. 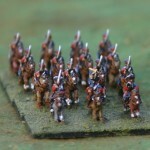 So I was very happy to see the Cavalry turned around so very quickly (2-3 weeks). 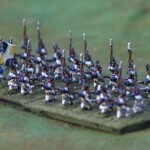 Here’s a gallery of images. 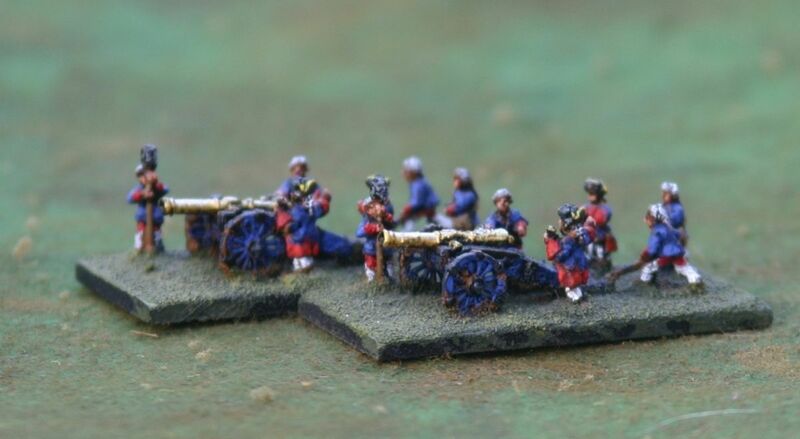 I hope you agree they’ve done a fine job, and maybe one day soon I’ll play some more Black Powder and be able to field these. 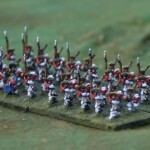 Knowing the way I issue orders they’ll turn around and advance off the battlefield…but won’t they do this in a fine style! 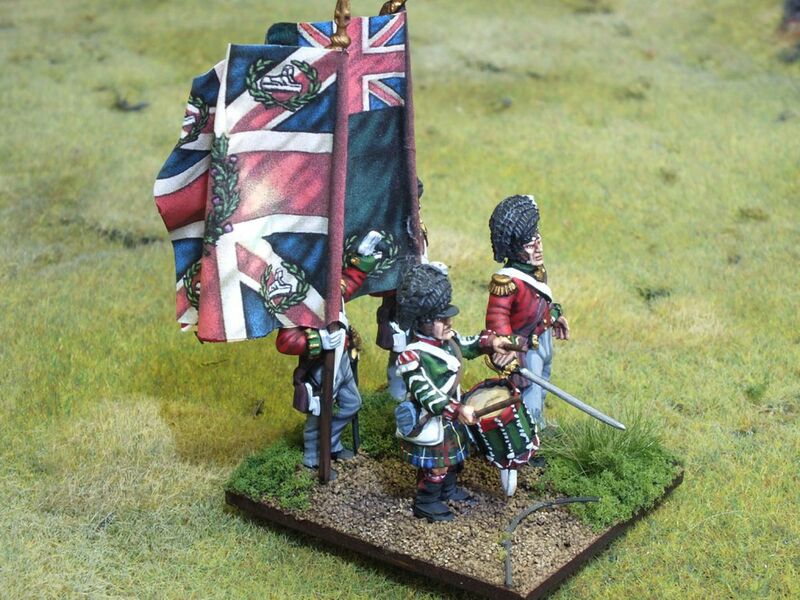 My time is up, time to post this and move on…. 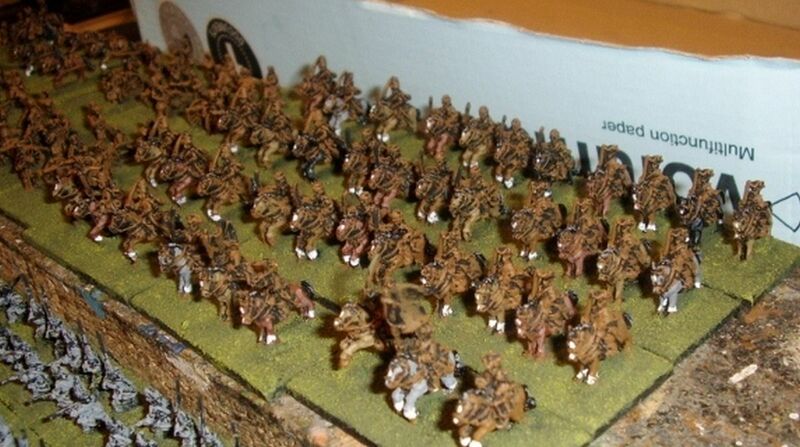 Part 4 already? 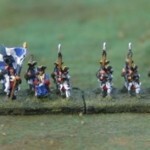 Seems so, and it’s quite logical as the previous posts are named as Part 1, Part 2 and Part 3. 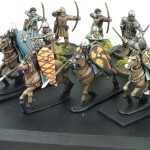 If you’ve not had a read of them, perhaps go back and have a look at the progress made but I’ll do a quick catch-up for all of those who haven’t, don’t want to or can’t be bothered. 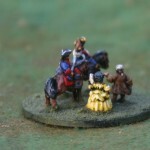 Back in July I was invited to watch (and ended up playing) a game of Maurice as I had shown an interest in our local club (Sheffield GIMPS). 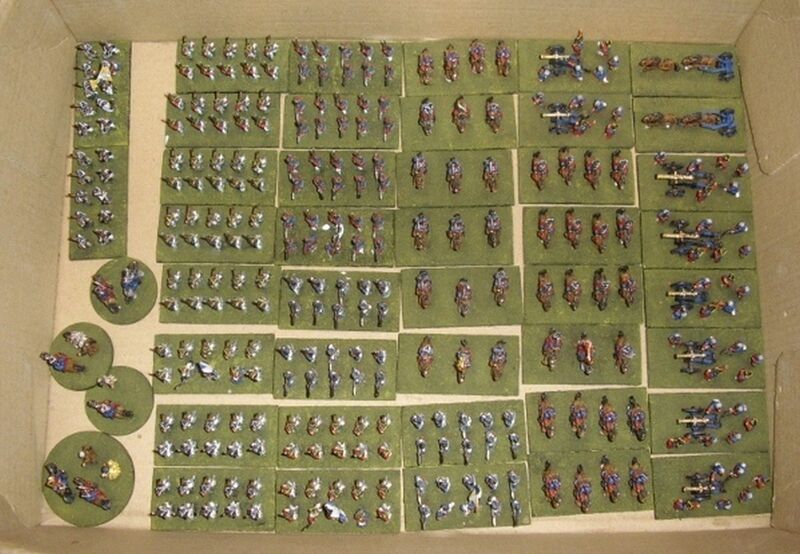 After that evening (and losing due to poor help from my tutor – The Goat) I loved the system and vowed to get an army for it. 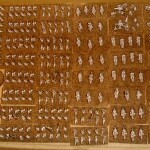 So I picked up 120 infantry, 15 cavalry and 3 guns with crew. 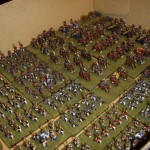 A week or so after the order a large bag of tiny 10mm figures arrived in the post. 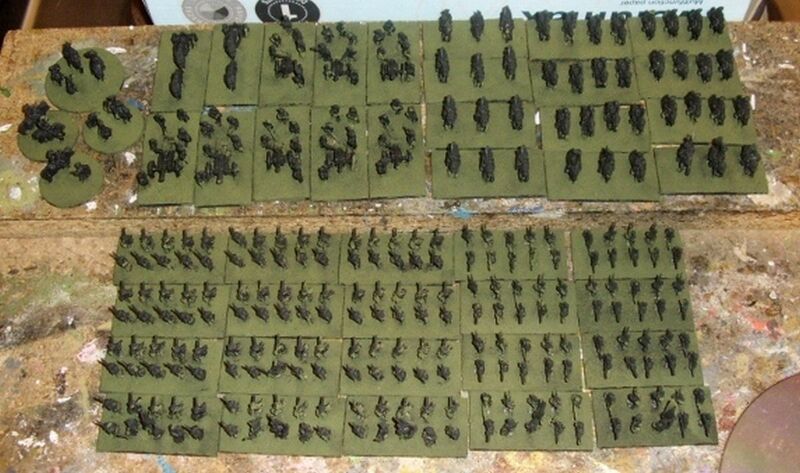 It was time to sort. 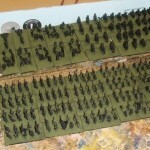 At this time I was given a load of mdf bases, measuring 2″ x 1″. 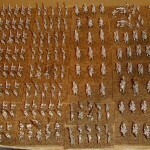 Should have been enough and was more than enough for that I had ordered. 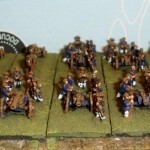 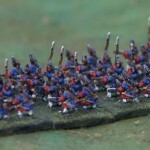 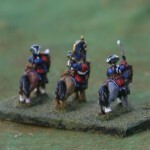 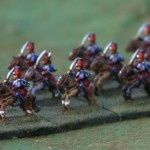 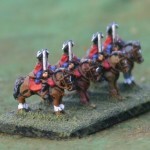 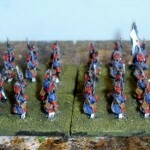 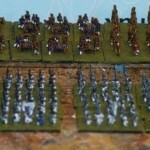 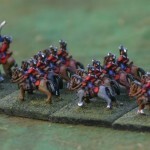 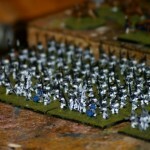 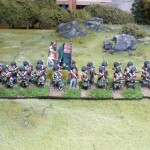 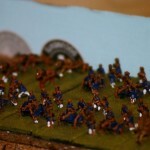 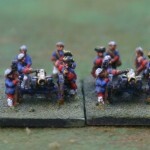 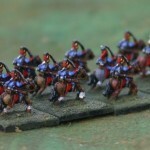 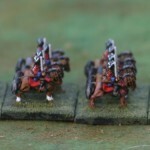 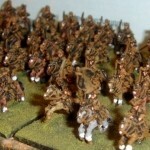 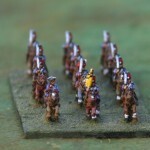 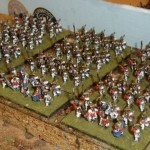 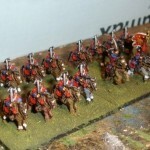 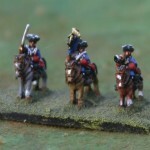 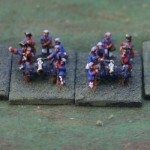 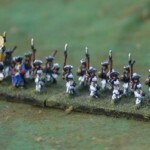 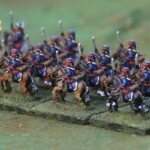 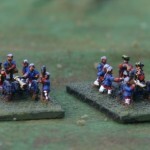 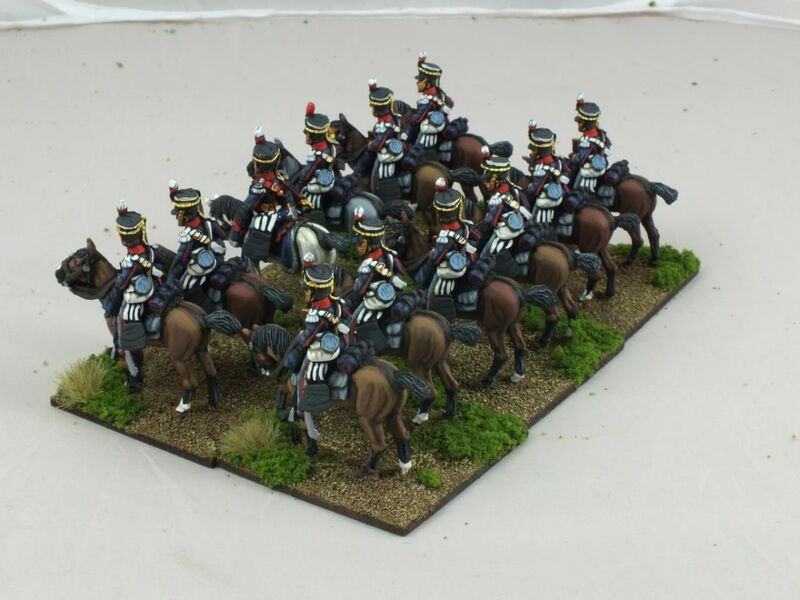 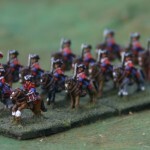 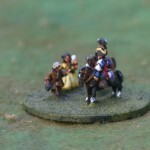 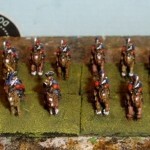 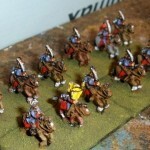 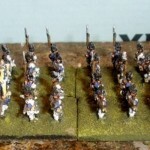 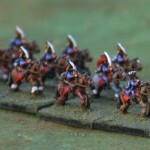 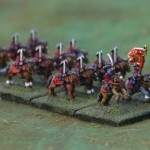 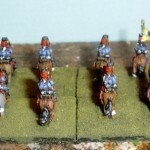 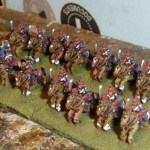 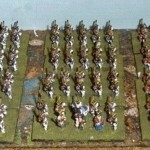 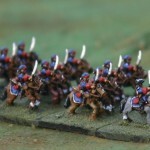 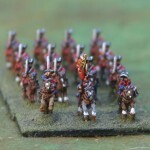 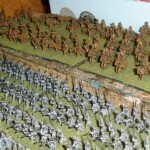 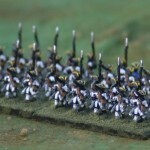 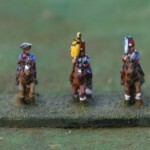 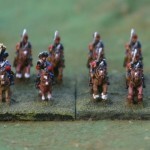 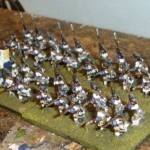 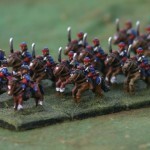 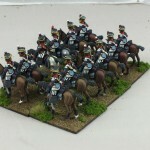 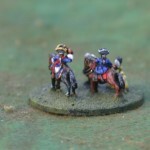 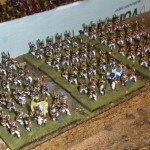 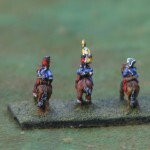 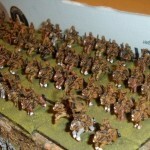 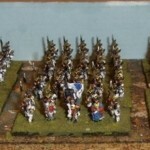 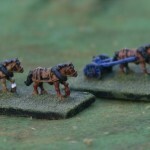 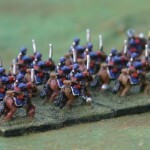 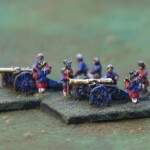 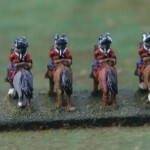 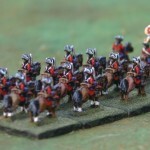 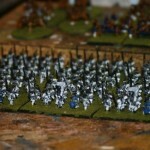 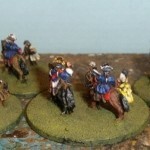 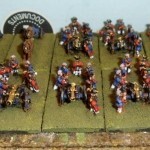 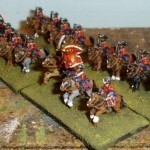 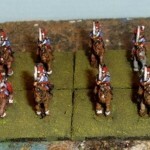 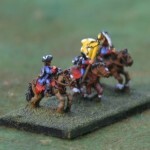 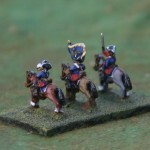 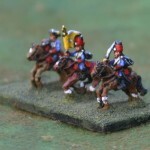 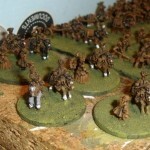 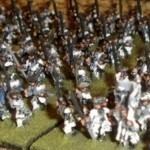 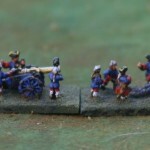 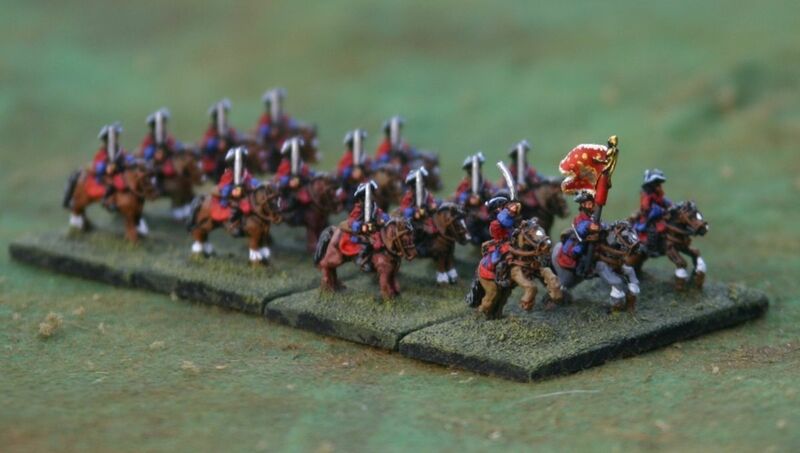 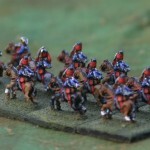 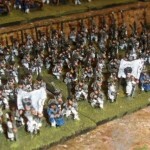 Each unit is based on 4 bases, so that would mean 20 Infantry, 12 Cavalry and 4-6 Artillery. 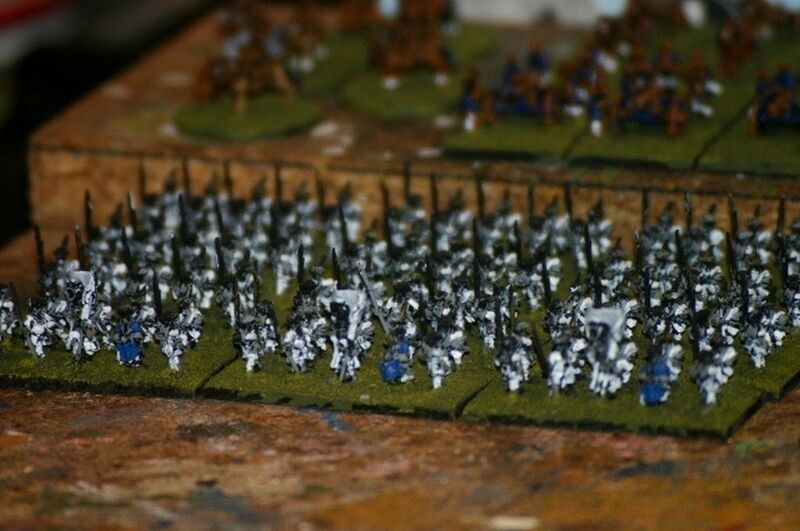 Looking at what I had, I could see that I didn’t have enough. 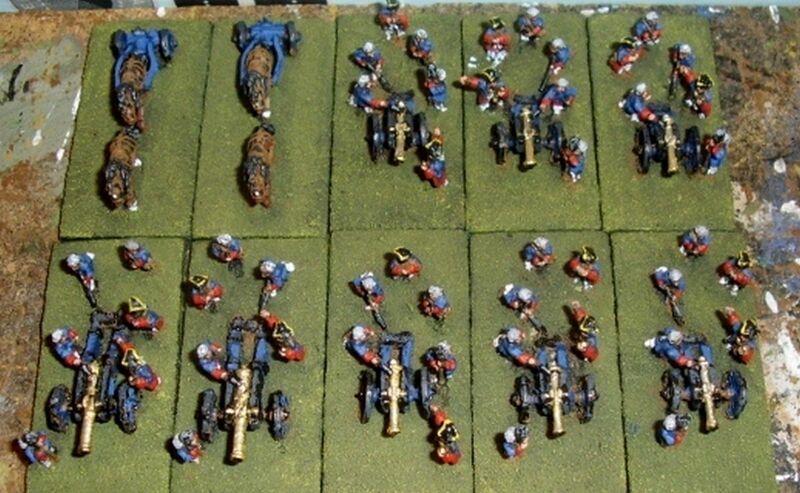 3 guns would make 3 bases (1 short). 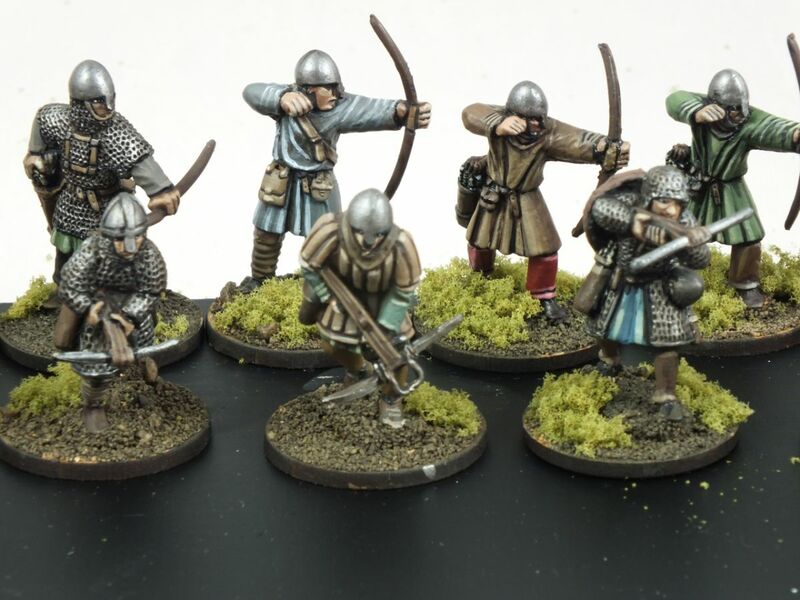 A quick check back on the Pendraken website and I placed a second order, this time taking into account some variance in the troop types. 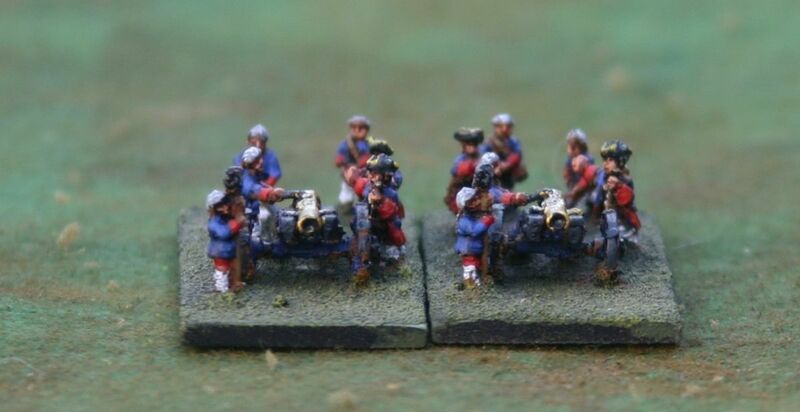 5 guns would make 5 bases (complete). 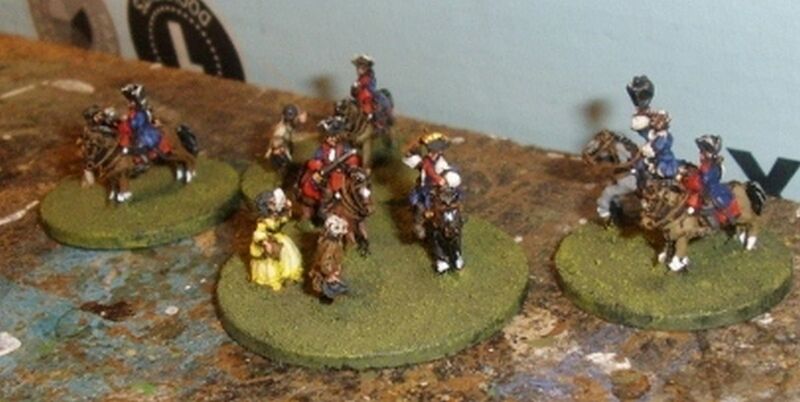 At this point I had found Nik Harwood and commissioned his painting services. 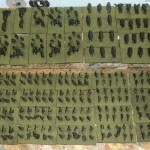 He was good enough to dry base all of the above and advise me on any figures that we were missing. 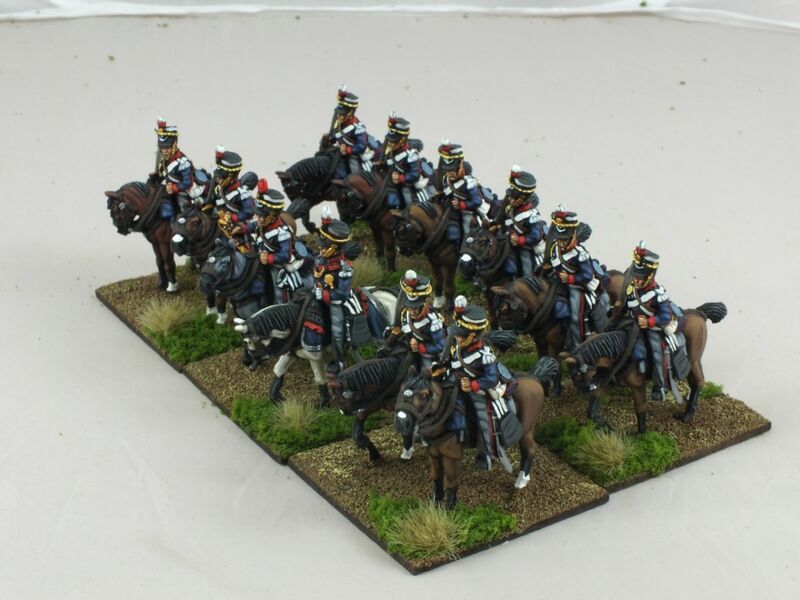 It just happened that I need another pack of Grenadiers plus some civilians for the officer bases and the 30mm bases for them! 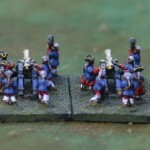 (Officers are based on 30mm round, the General is on 40mm round). 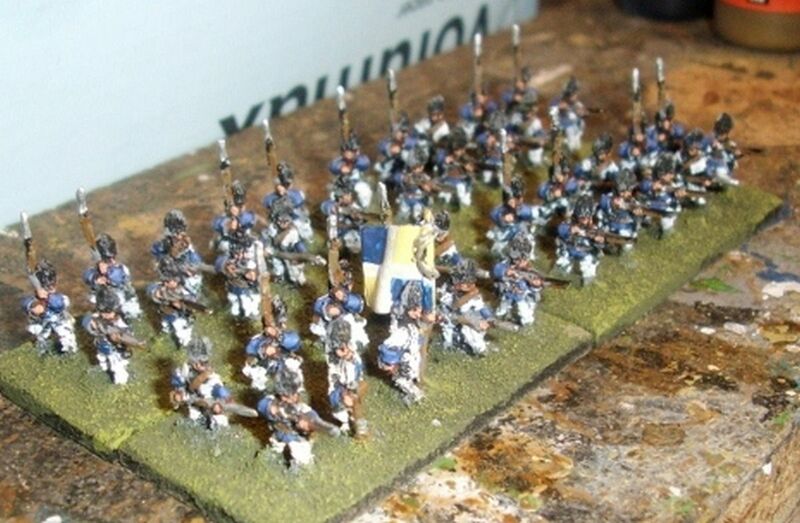 I had supplied some flags but more were also needed. 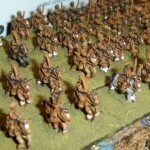 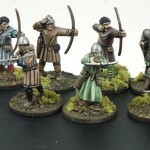 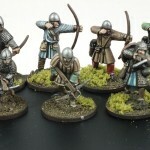 Plus a pack of 30mm round bases. 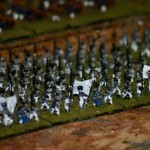 That extra pack of Grenadiers allowed me to field the missing infantry base. 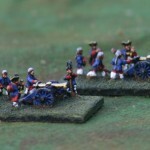 So now we had everything and Nik started work. 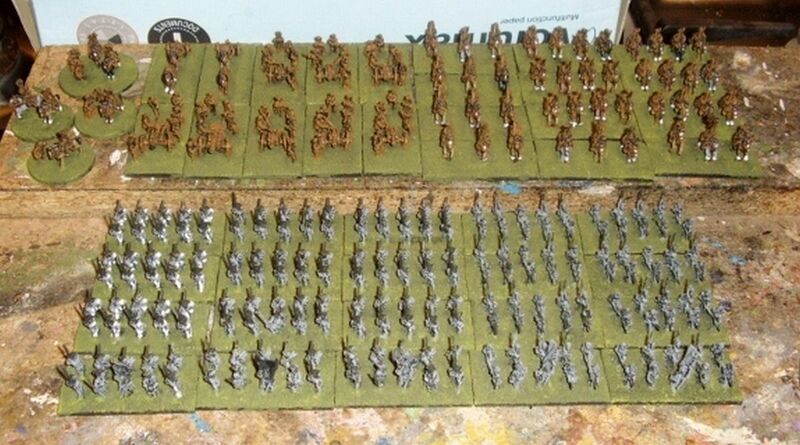 You can find details of then progress of painting this army in my earlier posts. 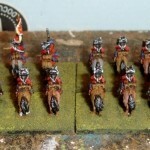 Zoom forward to Thursday 20th September and Nik tells me that all the work is done! 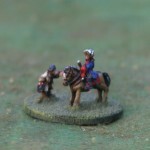 Along side with this great message he told me that he was going to take a number of hi-res images and the following day they appeared. 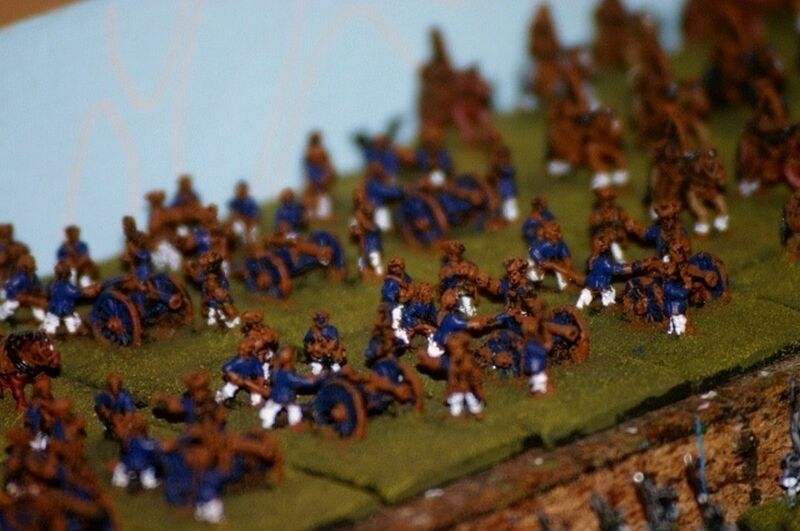 Here they are, please note there are a LOT of images. 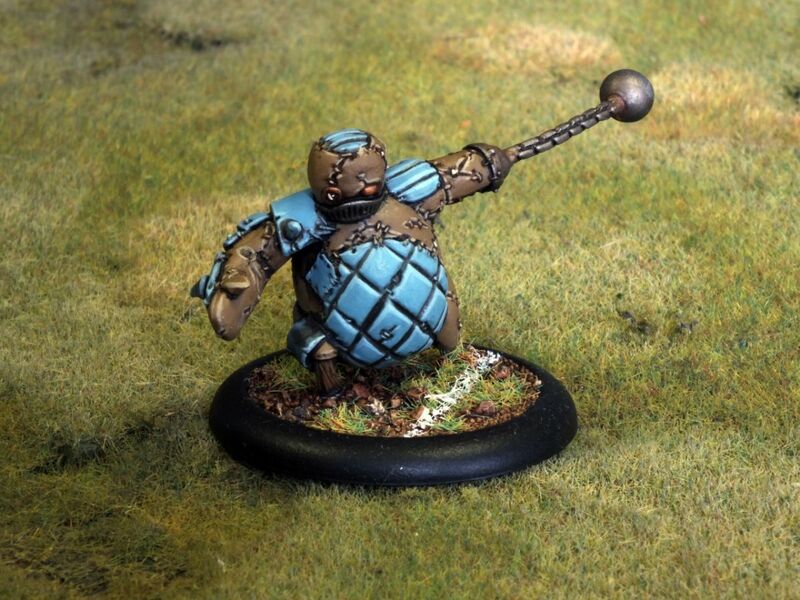 So there we have it. 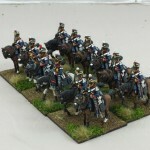 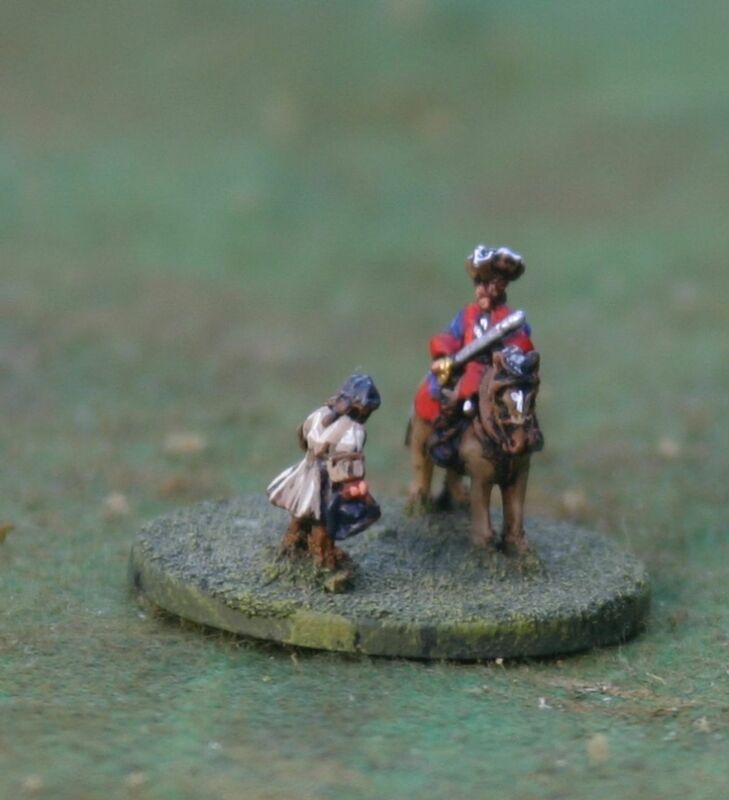 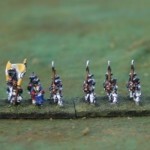 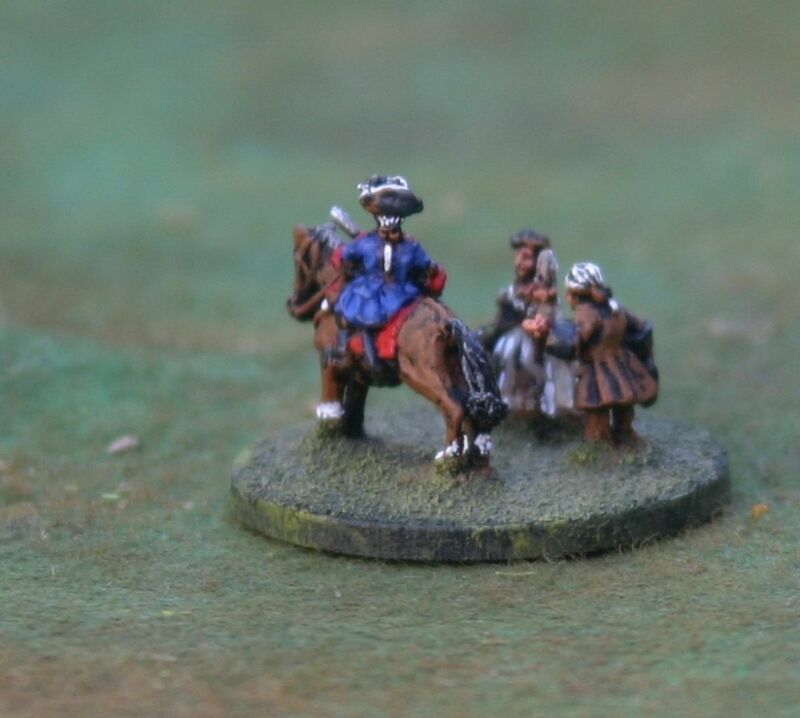 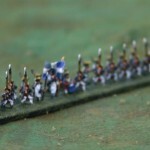 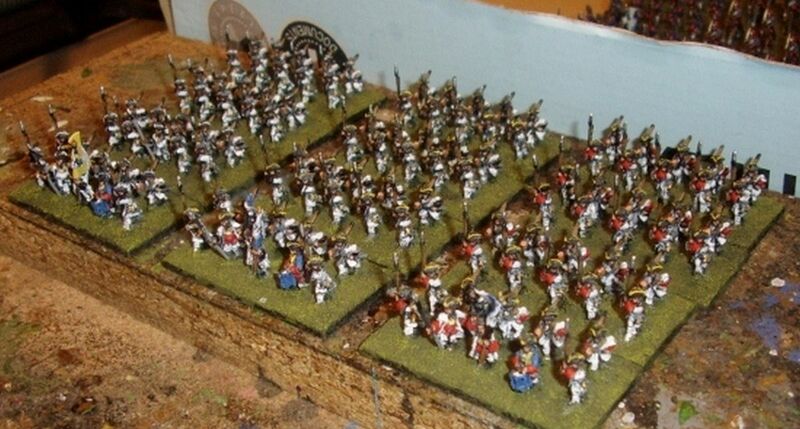 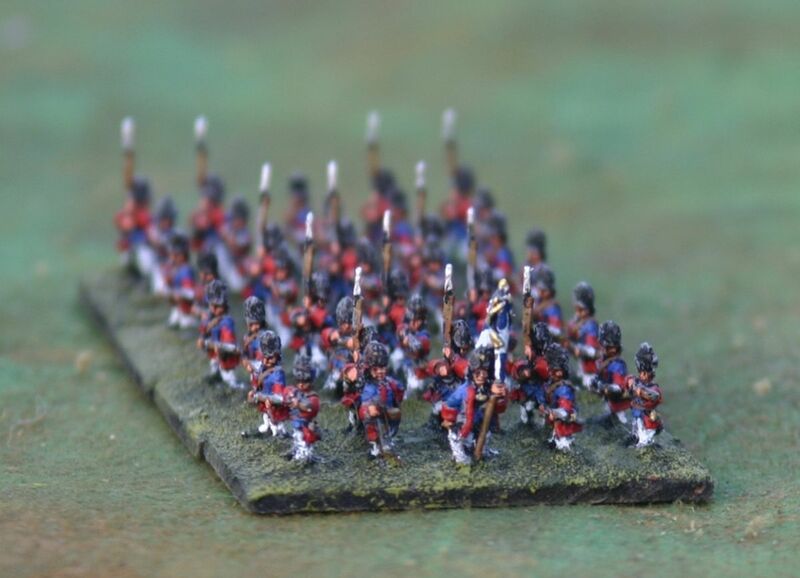 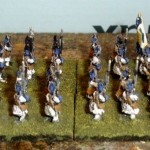 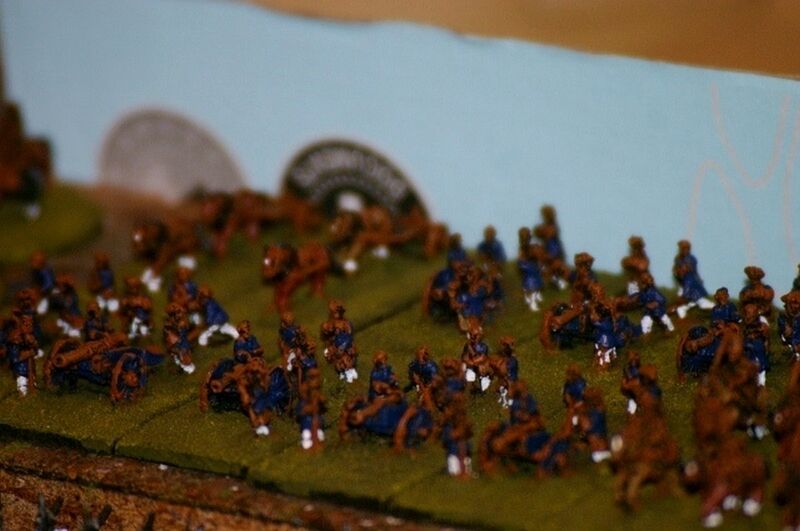 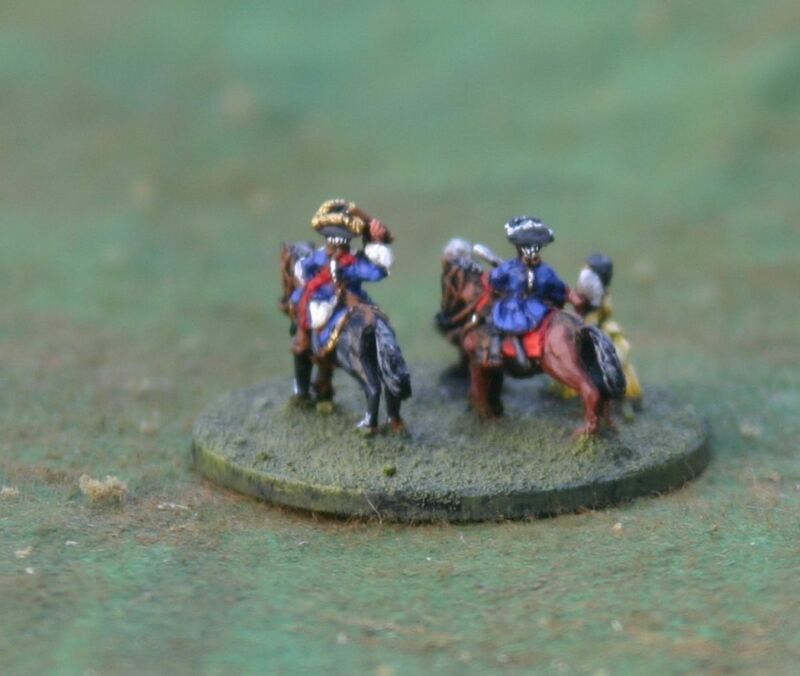 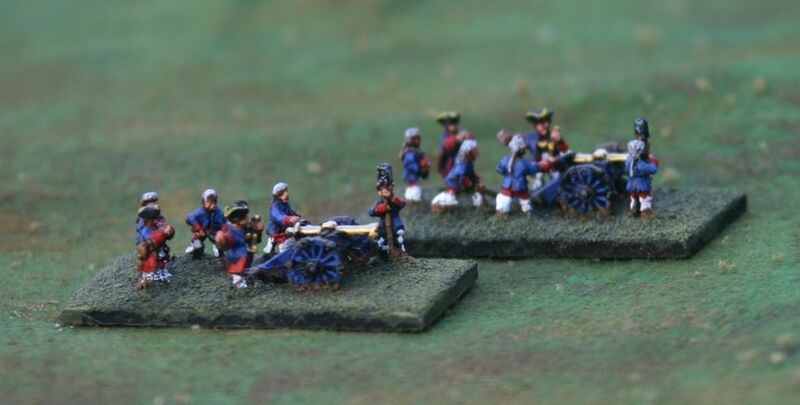 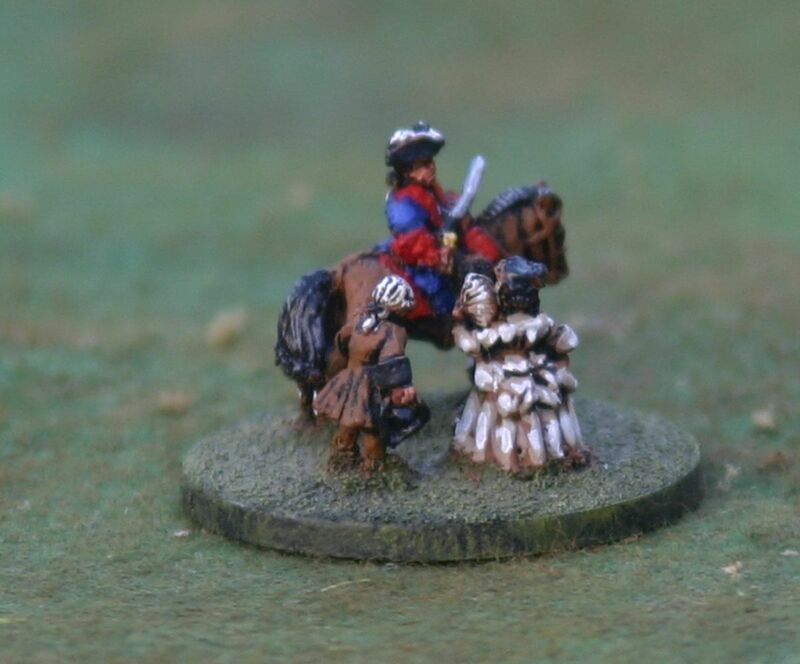 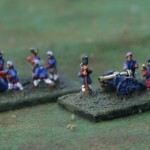 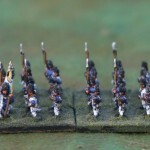 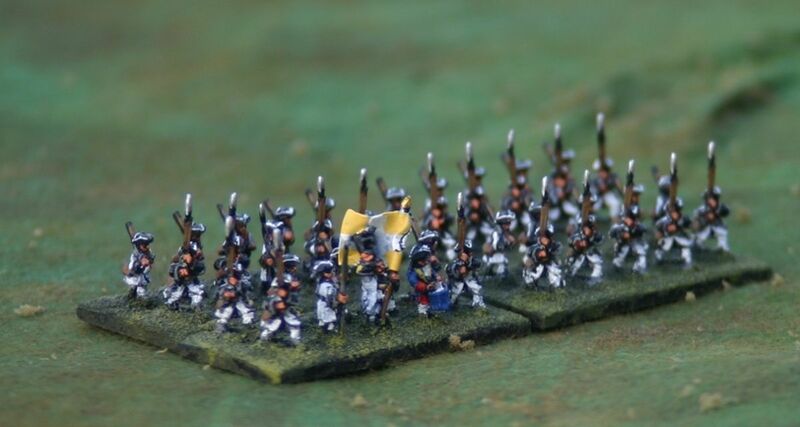 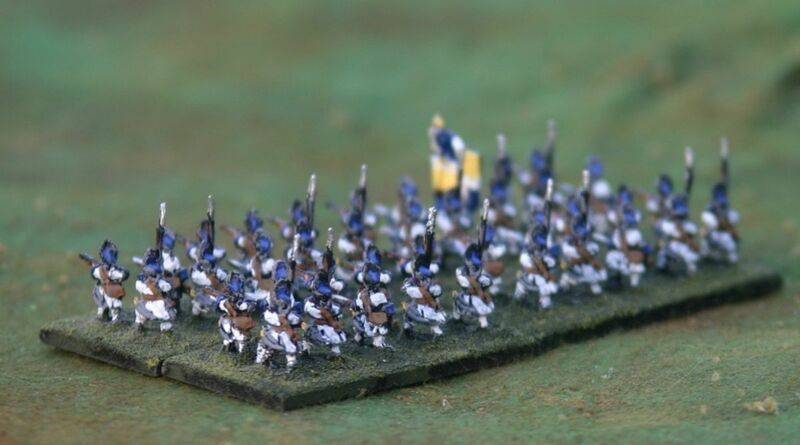 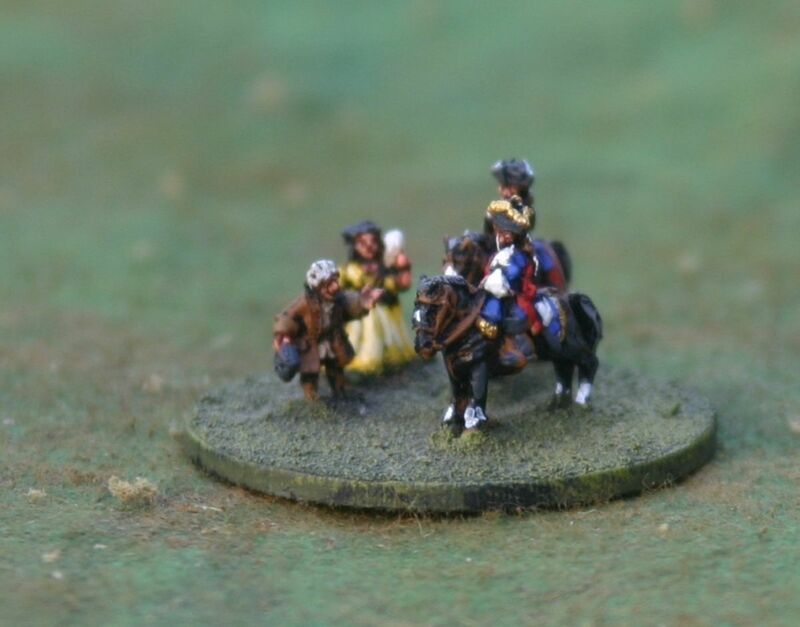 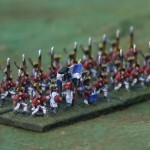 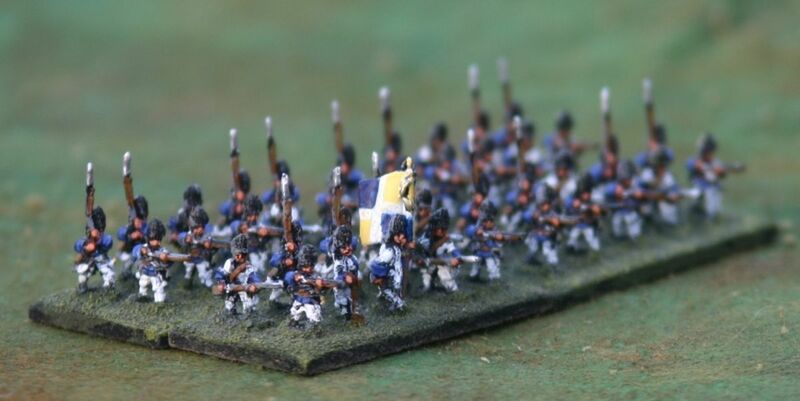 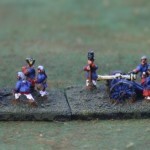 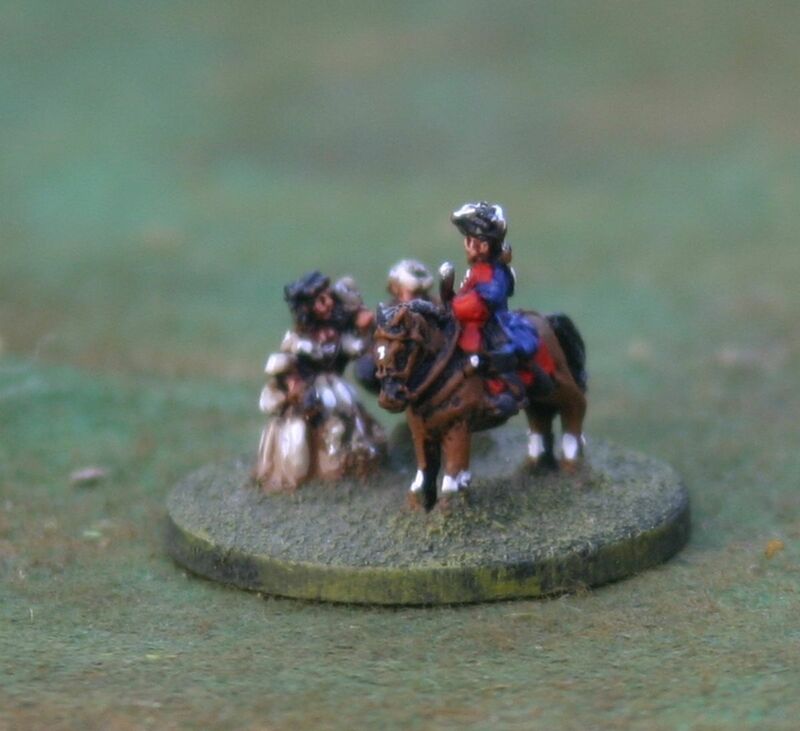 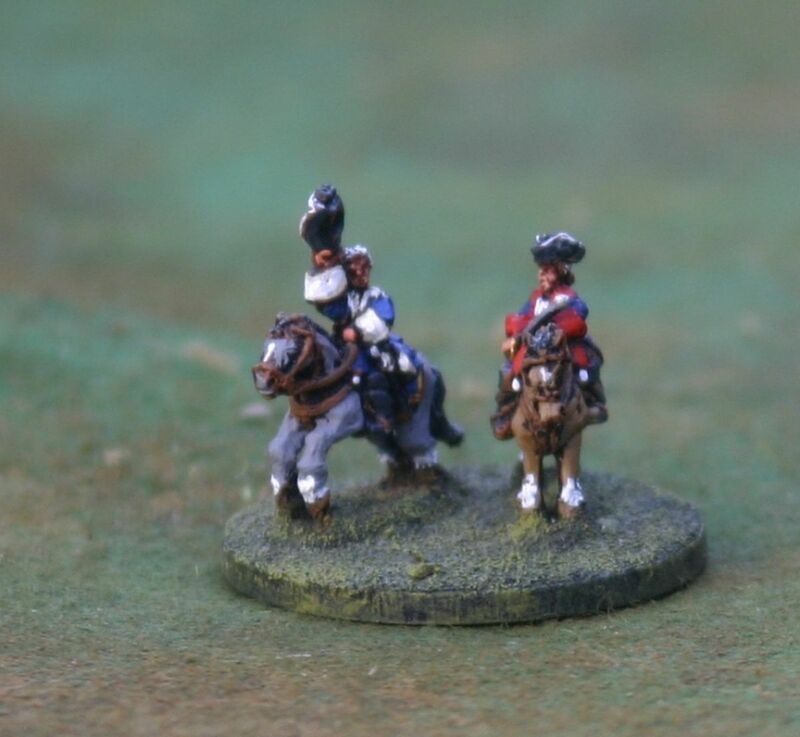 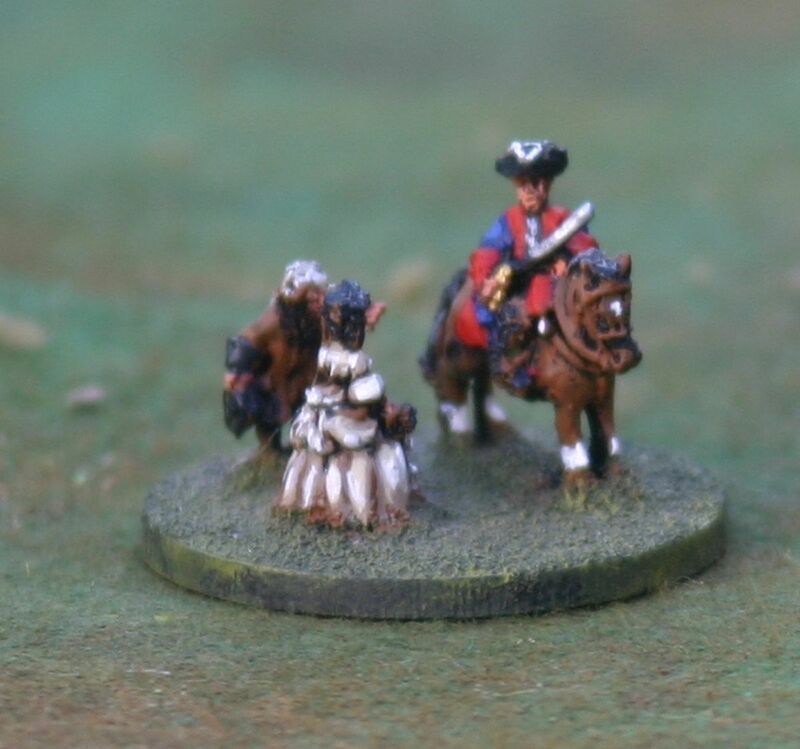 I do have a bag of spares, mainly bases but a few figures that were not needed – I did though learn a lot from this, and have used this knowledge for my next SYW army, Prussians – of which a post will be coming soon. 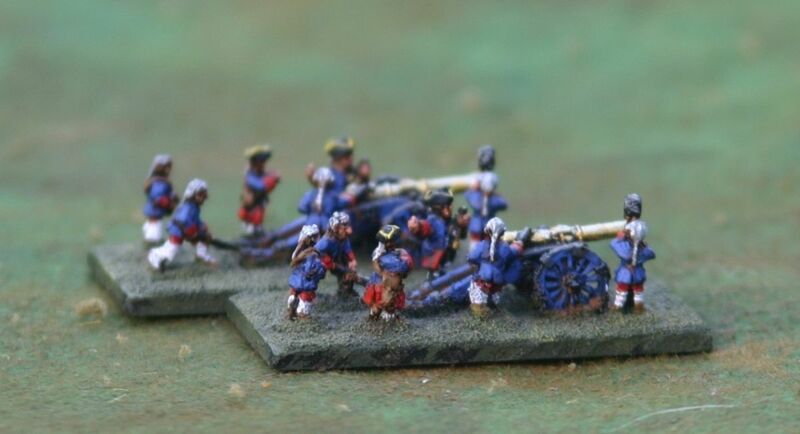 What did this all cost to be painted? 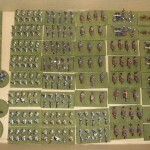 Nik has been kind enough to provide me with the spreadsheet that he used, from which you can see his individual prices. 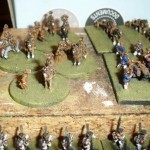 I shall be creating a new set of pages (shown on the top menu) for the painting services that I use. 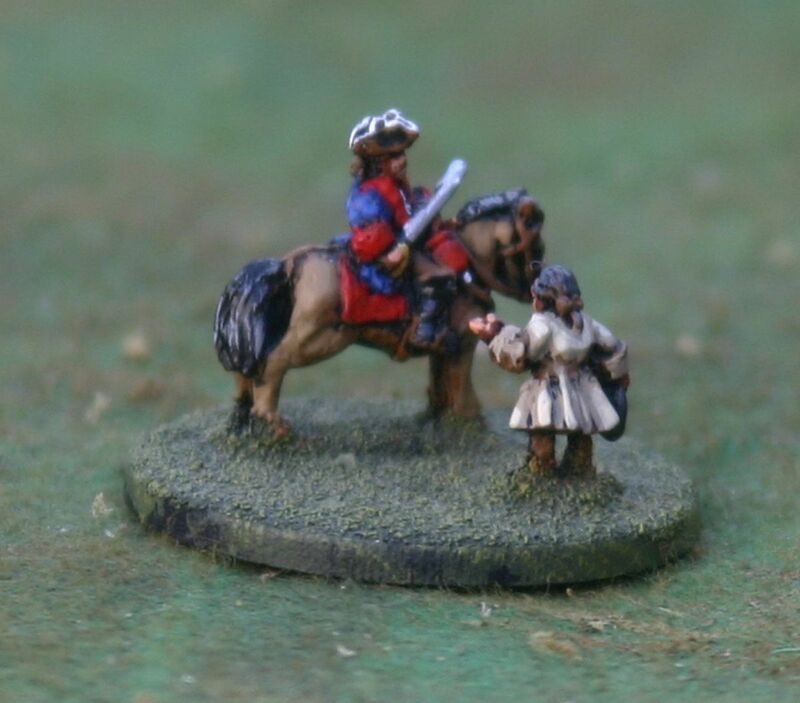 As you can see below his prices are very good and I think you’ll find that his work is also very good. 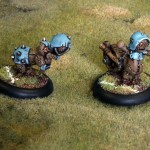 Nik’s communication is very good. 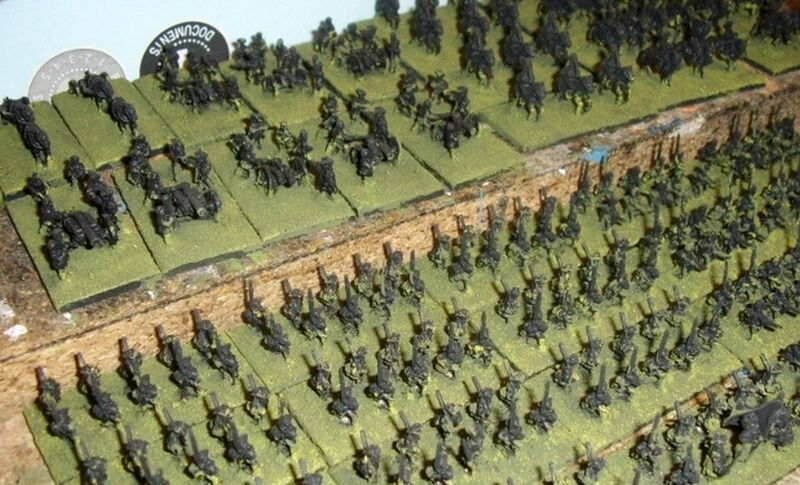 I had many questions (wouldn’t you?) 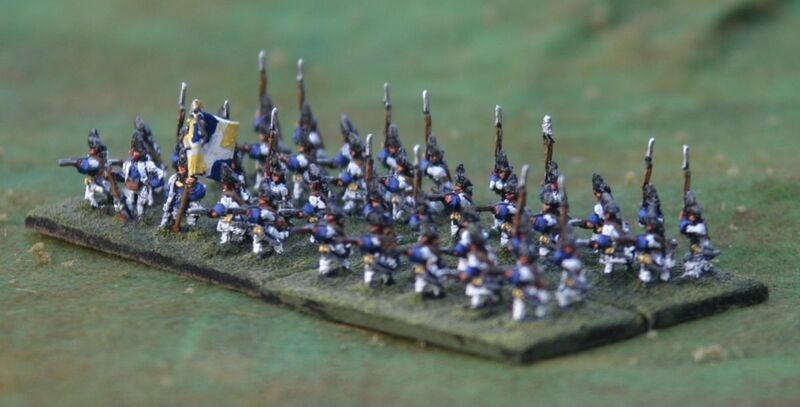 and he was kind enough to answer all of them. 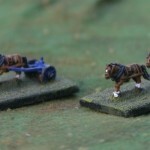 Not only did he answer questions it seemed he understood my world of ‘very busy’ and he himself was in a similar situation – so how he found the time to paint these I’ll never know. 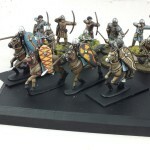 Maybe if I stop blogging I’ll have the time… reminds me, must continue with my Vikings. 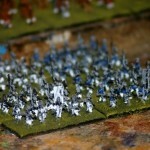 Nik also helped out with the research into how the army and certain units should be painted. 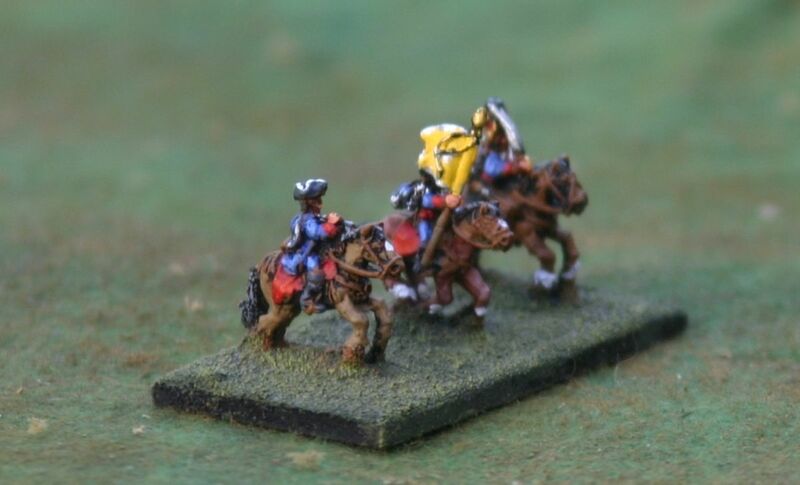 There’s a great online web reference that I’m just getting used to, it’s called Kronoskaf and it’s a wiki. 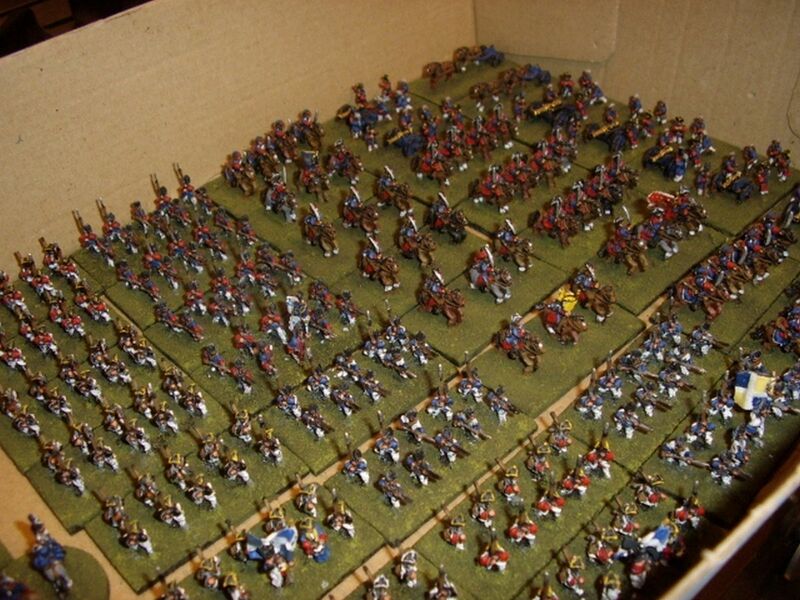 Have a look and you’ll see so much information that it’s daft. 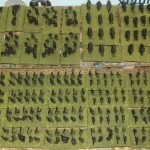 If you do use it then please donate, I have. 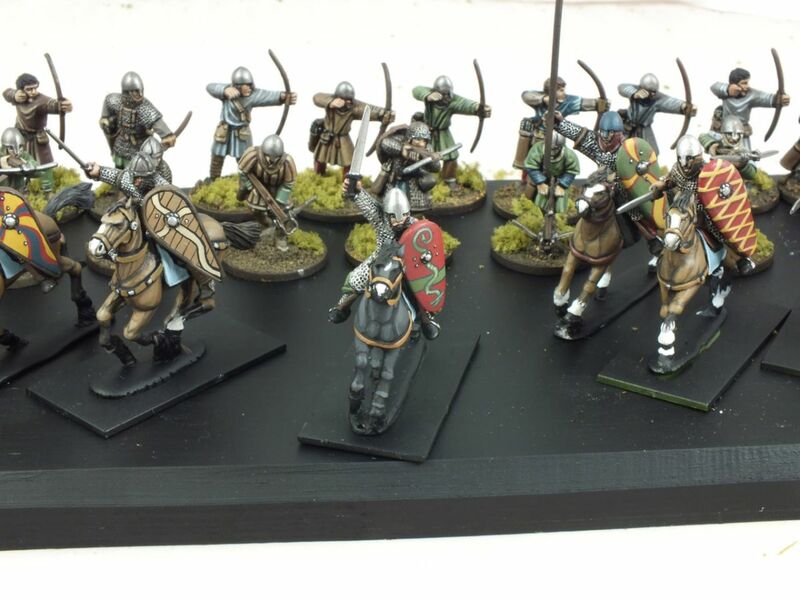 Now that I have the models with me I feel that the cost to paint over the time it would have taken me to be a good decision on my part. 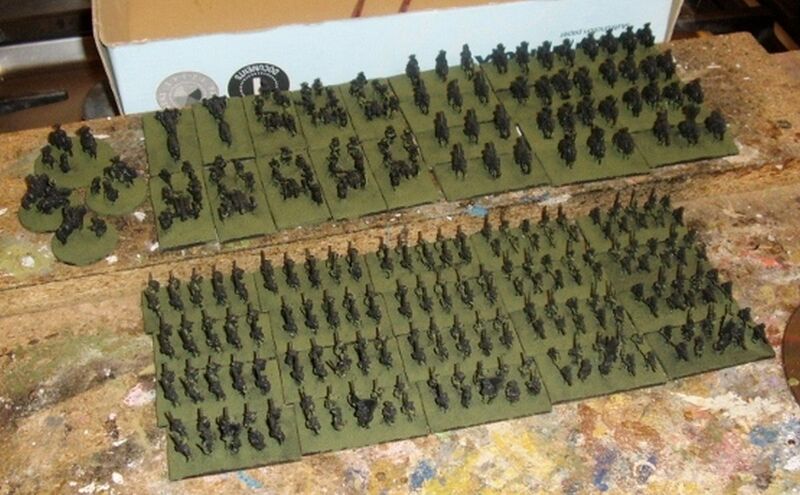 Yes paying almost £280 to get an army painted isn’t cheap, however if you add the cost of the army £60, then it’s just £340 for something that I have and can use again and again. 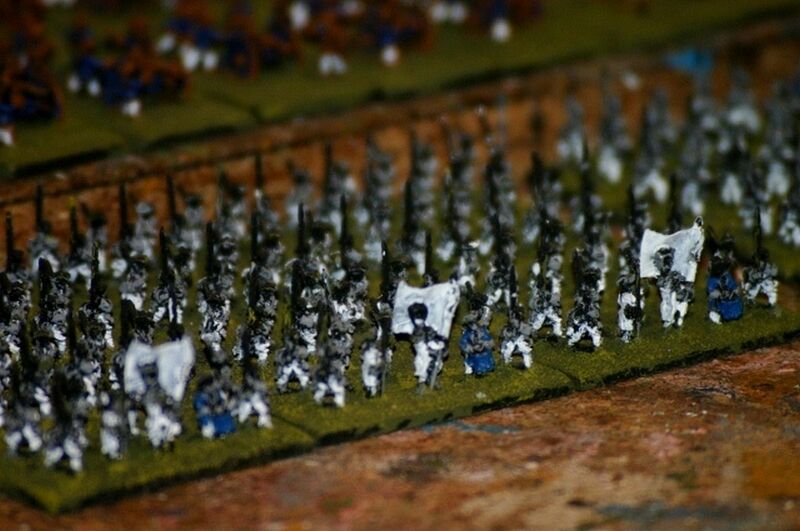 Yes I could have waited and done them myself but let’s be honest here 100mm is so small, too small for me. 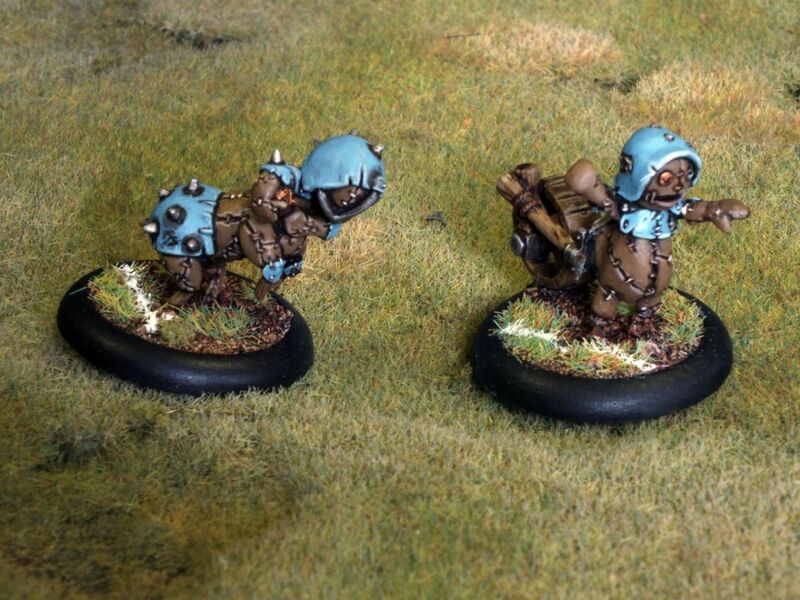 So they’d have been silver or maybe black for years to come. 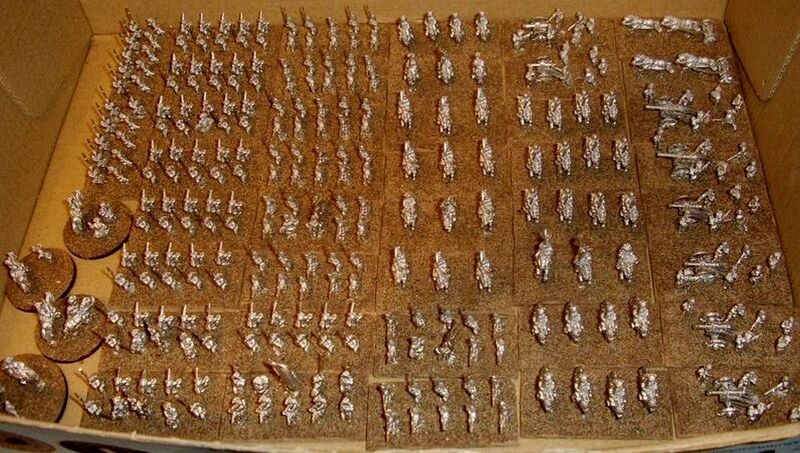 One of my 15mm armies is still silver and I bought that back in 1994. 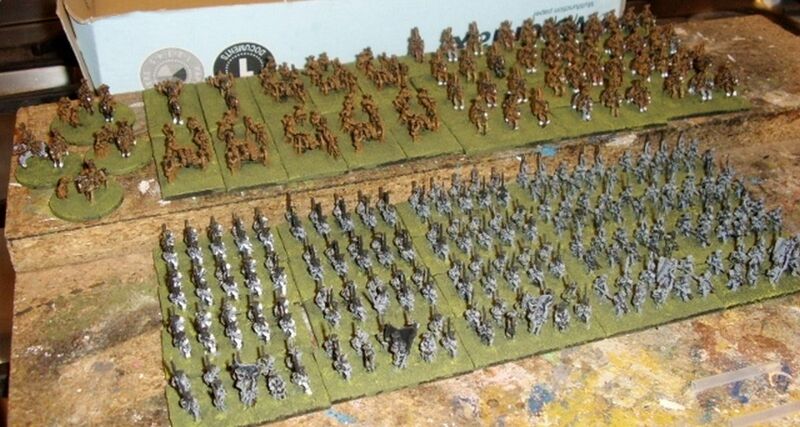 Right that’s it. 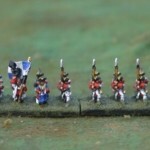 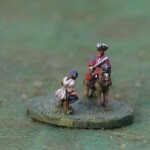 This is the end of the small series following my first 10mm and SYW army, there’s a new one coming, do let me know what you thought of these. 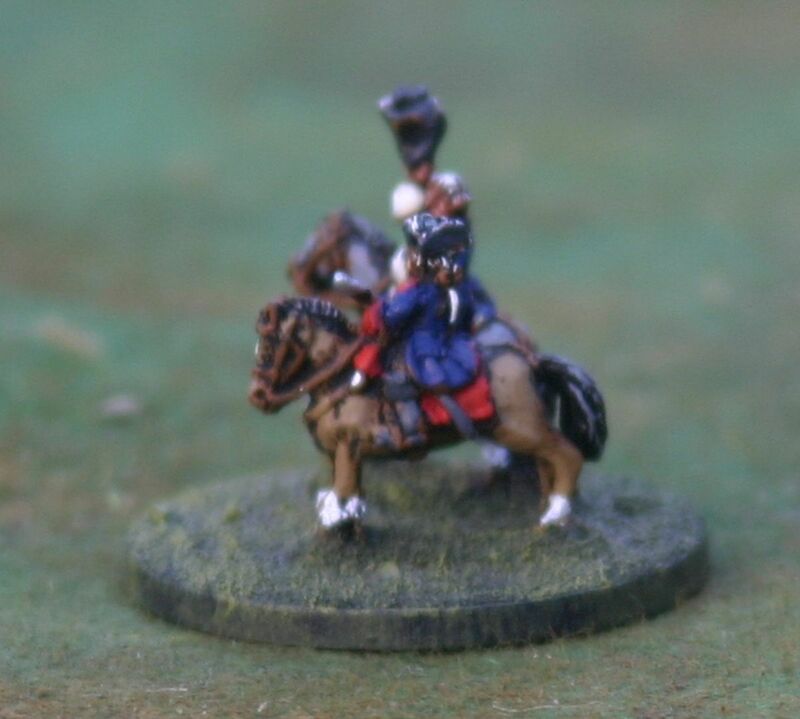 The Prussian series will contain more info of why I have bought what I have and why i’ve gone for the amount of infantry etc, more in line with Maurice. 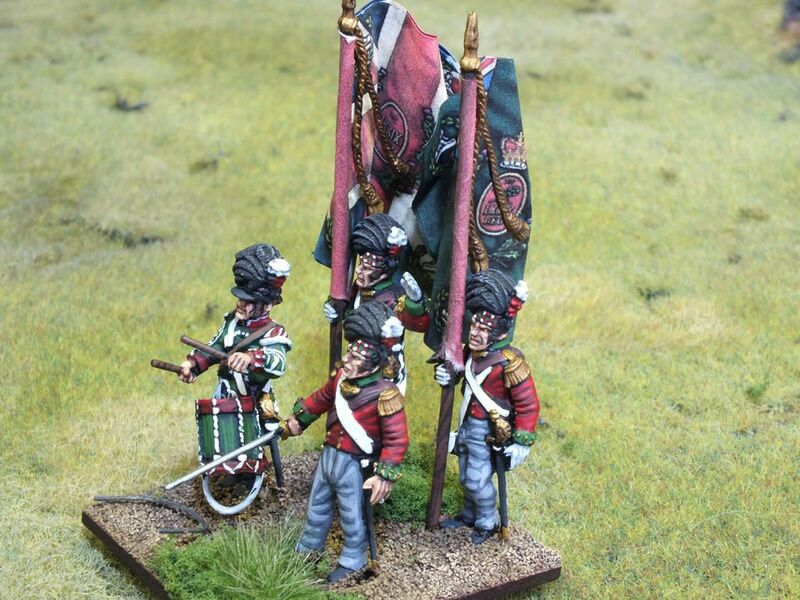 Edit: I also forgot to say that I am returning the Flag Packs to Pendraken (thanks again Leon) as the figures come with cast on flags and so don’t need the paper flags. 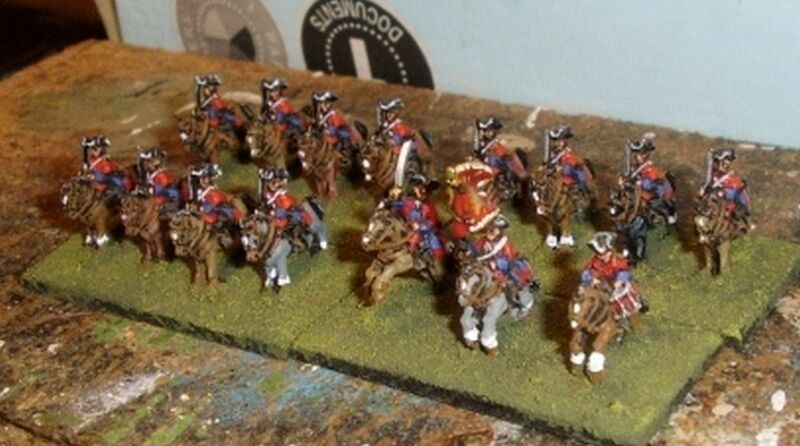 We happen to be at Part 3 already and I am already working on Part 4. 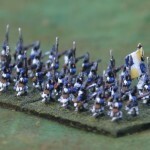 Time (not a good friend of mine) has moved on since my earlier posts (here and here), and I already find myself behind in posting this. 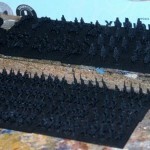 So what’s in store for this post? 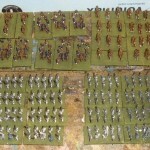 To be frank, another quantity of pictures (more than last time so please note!). 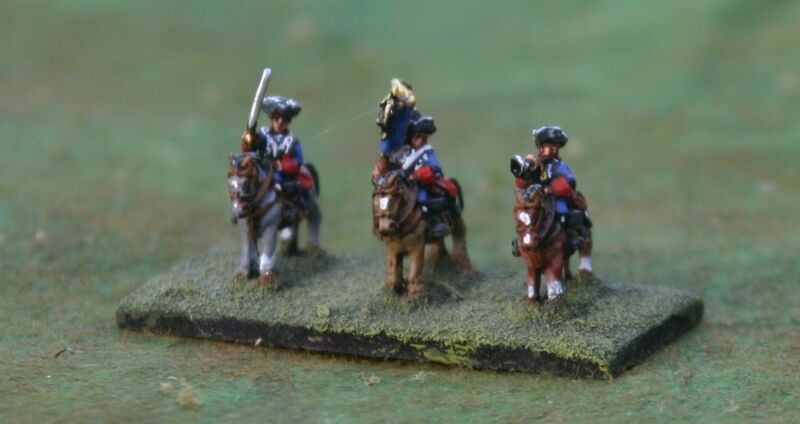 I will though remind people that that chap who’s painting these figures (I struggle to see 15mm to paint let alone 10mm) is still keeping me well informed and he’s been good enough this past week to give me an updates. 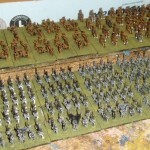 His latest update was given the subject “All done!”. 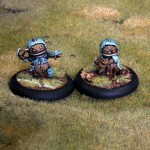 Similar to the last post i’ve also kept following his painting diary thread (on the Pendraken Forums). 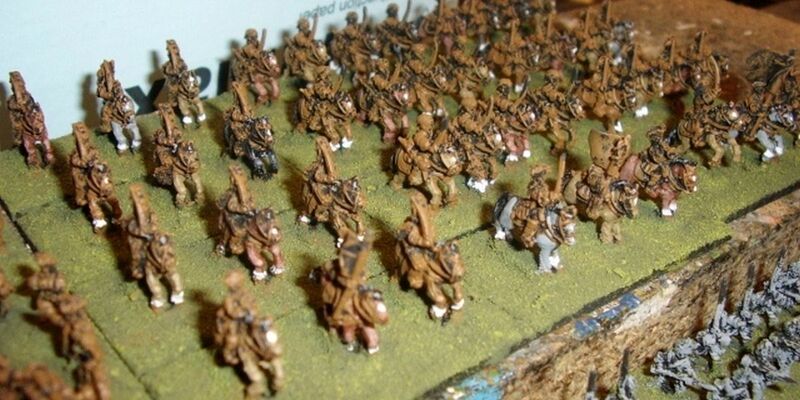 You can find on that thread more detail then I’ll mention here such as colours used on each troop type etc, so go take a look and let Nik know what you think. 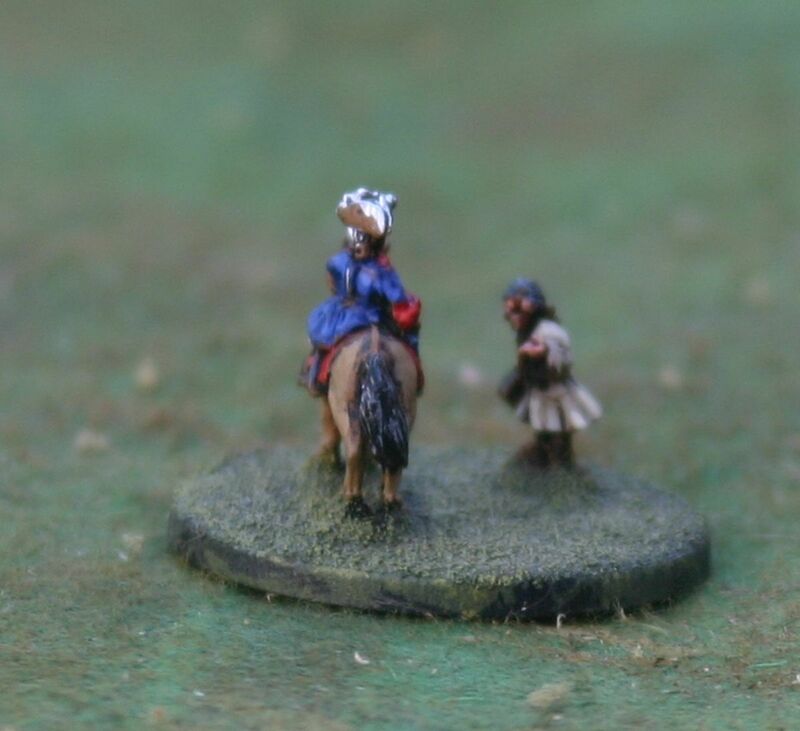 To quickly recap. 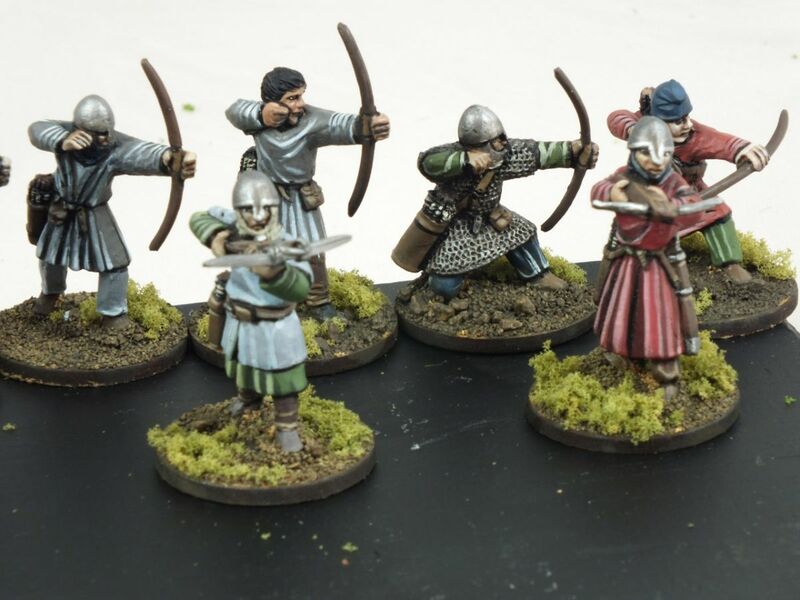 Last weeks post showed you pictures of the undercoated French, then with base colours and then final basic colours, this weeks post shows the finishing touches that Nik has put to the figures, and without further ado here we go! 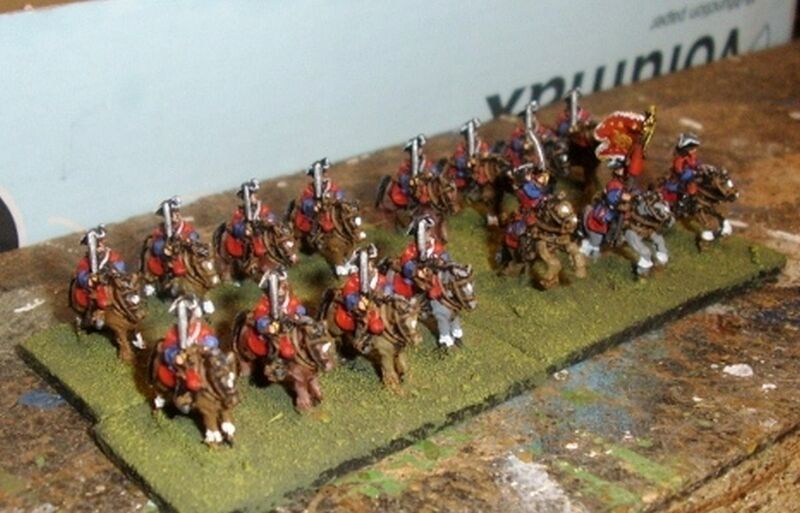 And close behind the Hussars! 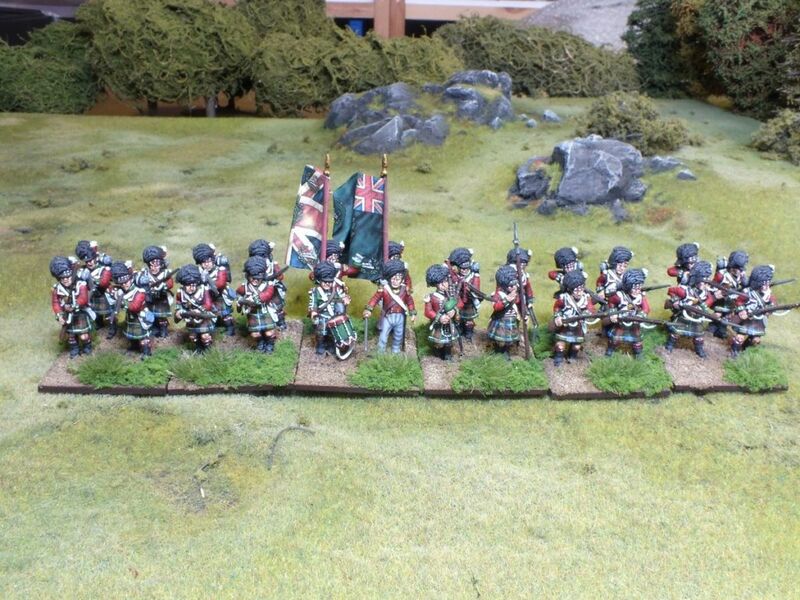 Following on the Grenadiers Royal Marine. 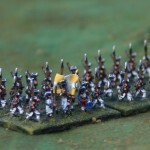 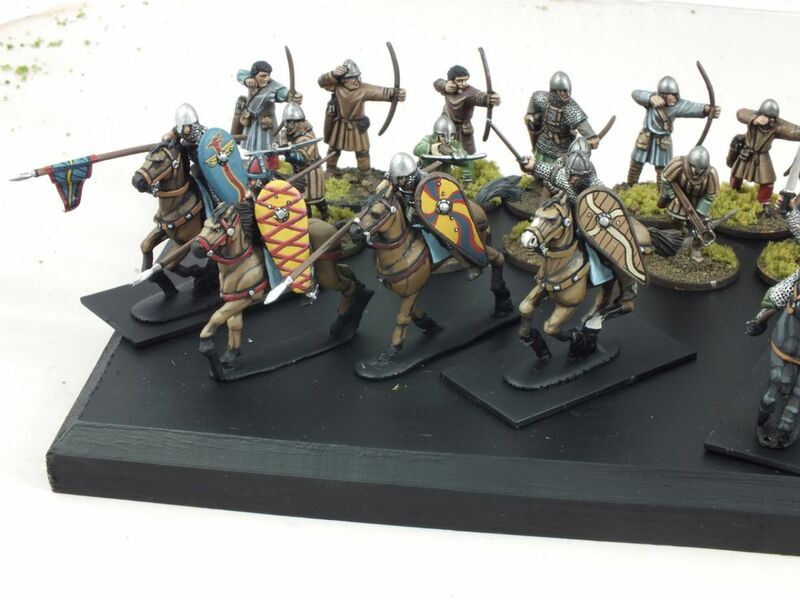 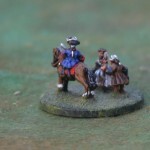 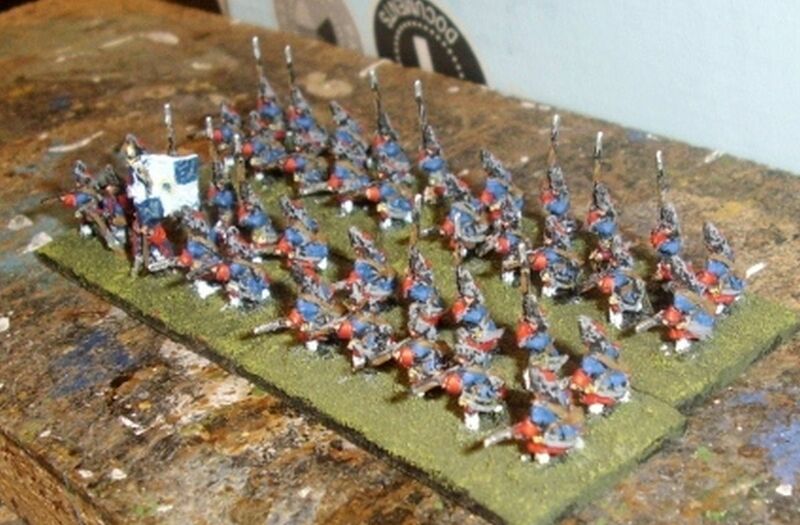 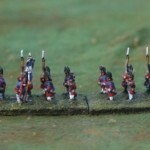 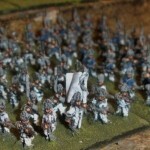 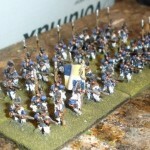 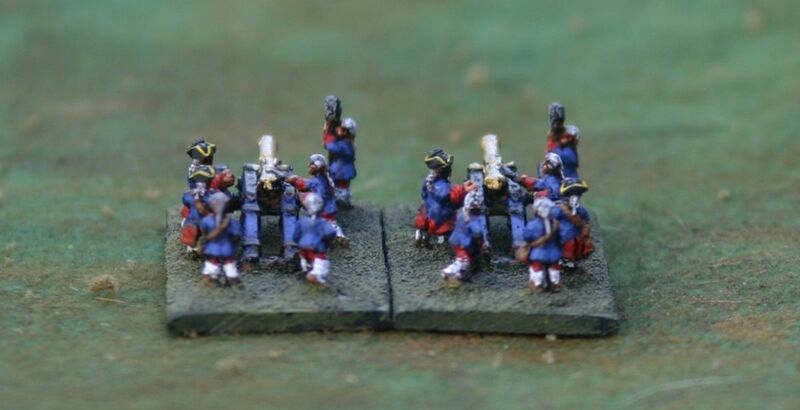 And to complete the Infantry, some pictures of them all together along with the Line Infantry (not shown here). 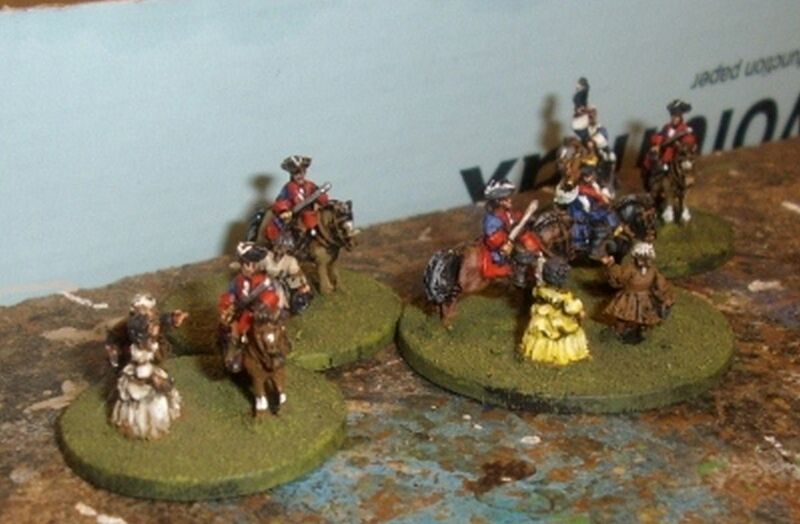 Finally we come to the Command, Nobles and Notables. 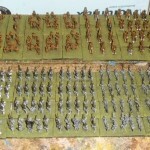 And even more finally a couple of pictures of the army all together, how excellent does this look? 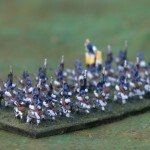 In the next and final post in this series I’ll show pictures of the models hopefully being fielded against some British, perhaps also do a battle report (in another post) and give a complete breakdown of the costs so you can see if getting Nik (or any other professional miniature painter) works for you, it has for me on this occasion, a few occasions before and I suspect a number of occasions in the future. 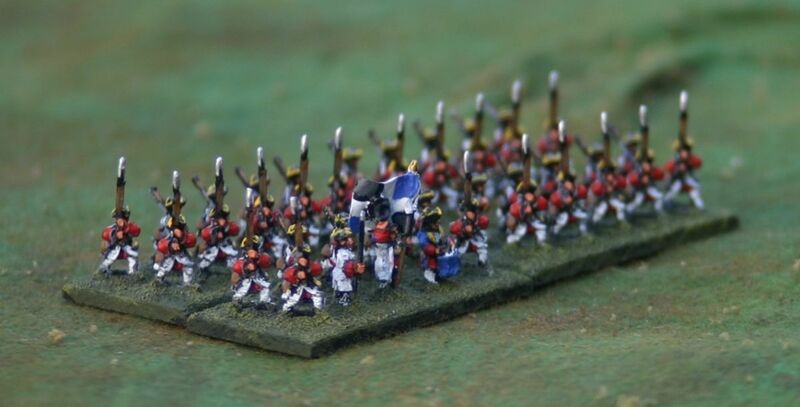 A simple blog post just to keep myself up to date with things happening to my SYW French. 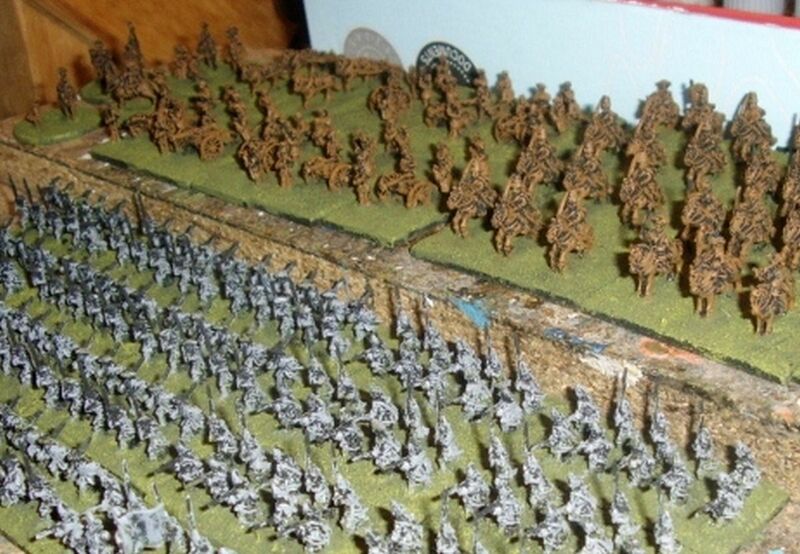 Be aware this is a photo heavy post. 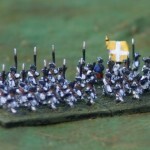 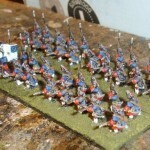 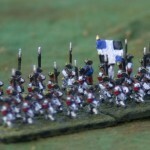 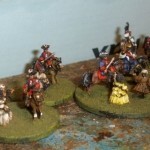 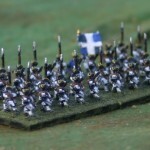 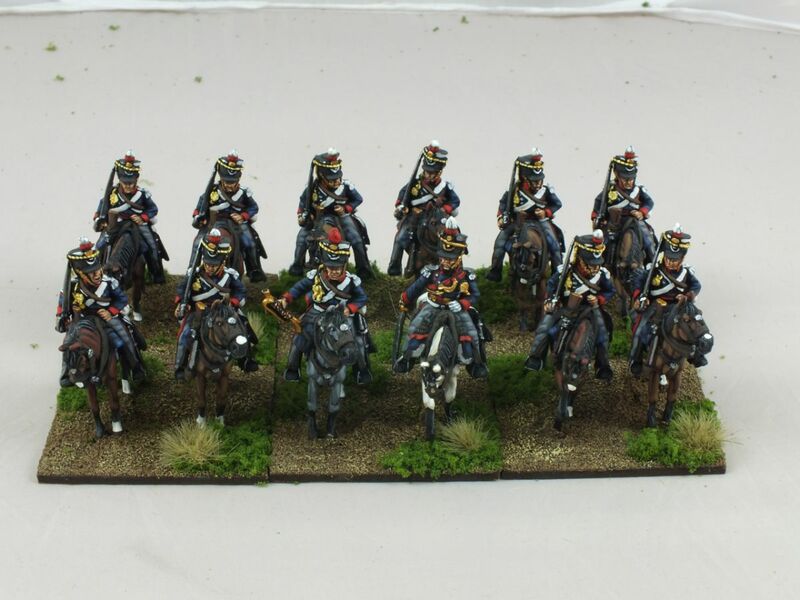 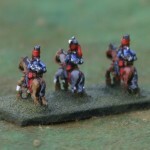 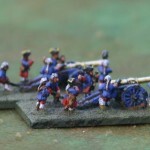 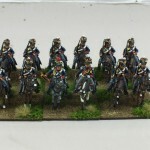 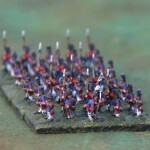 A week or so ago I posted the first part of the SYW French army that I’m having painted by Nik Harwood. 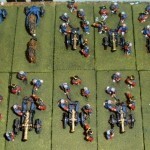 Since then Nik has kept in contact with me, keeping me informed as to his progress. 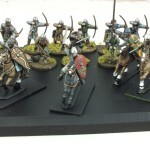 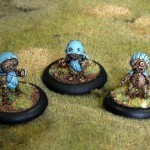 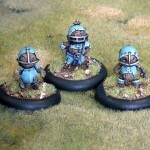 I’ve also been following his painting thread on the Pendraken Forums (linked in the first part, but here it is again). 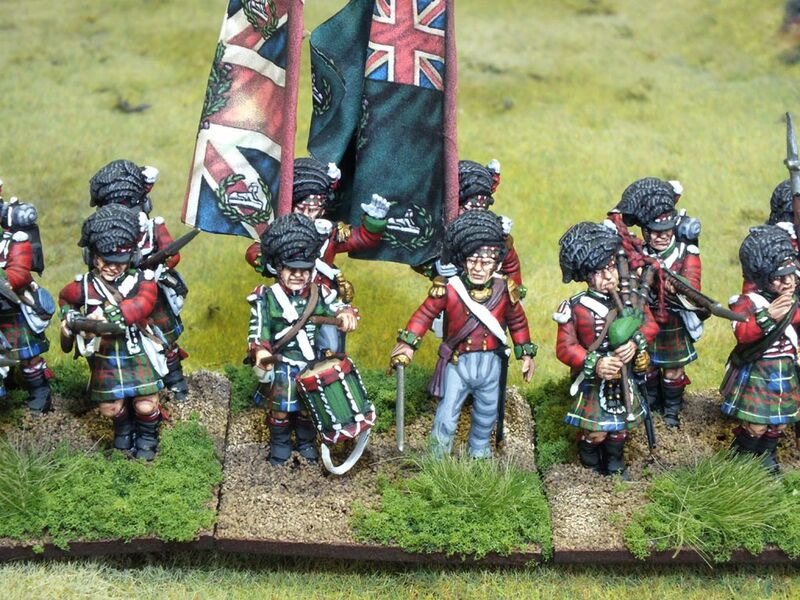 Rather than trawl through that thread (which you should as Nik goes into details that I probably won’t here) I thought I’d collate all the pictures and basic details as to the progress. 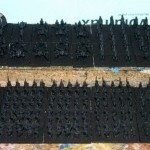 To start then, here’s pictures of the figures all tidied, based and then undercoated. 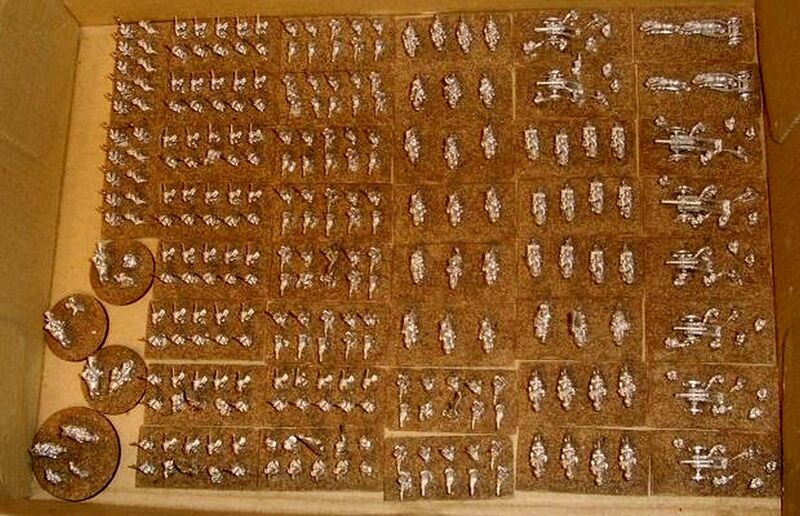 You can see all the work that’s been put in. 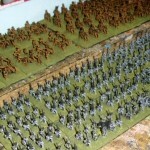 First the tidying of the figures and 10mm figures are tiny. 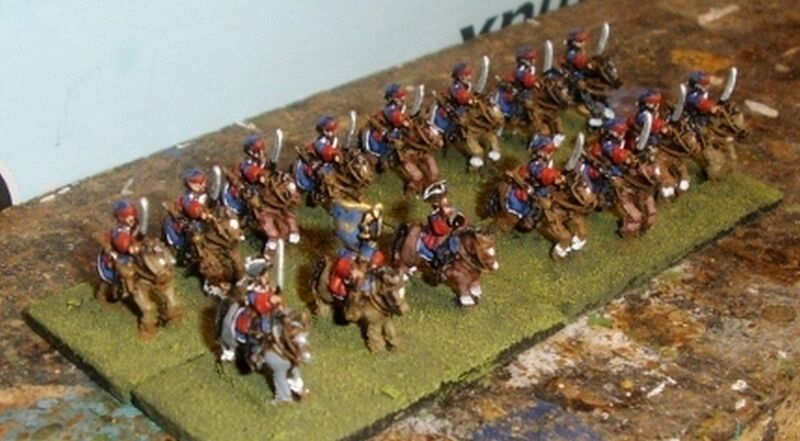 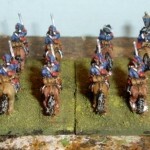 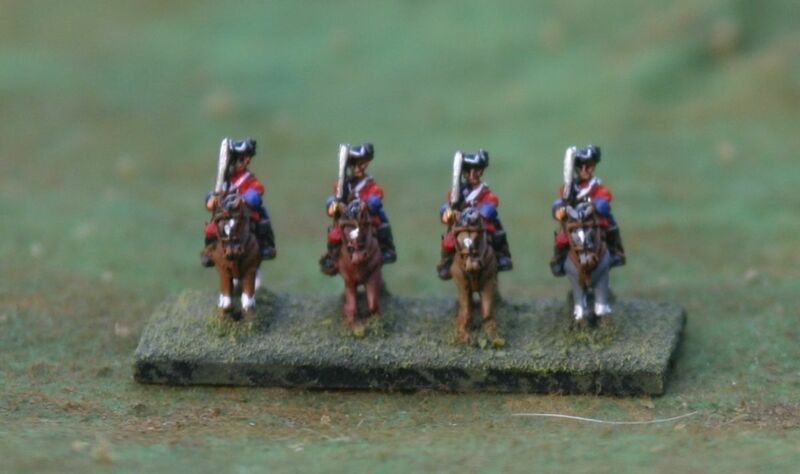 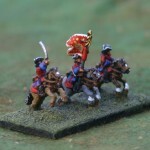 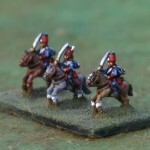 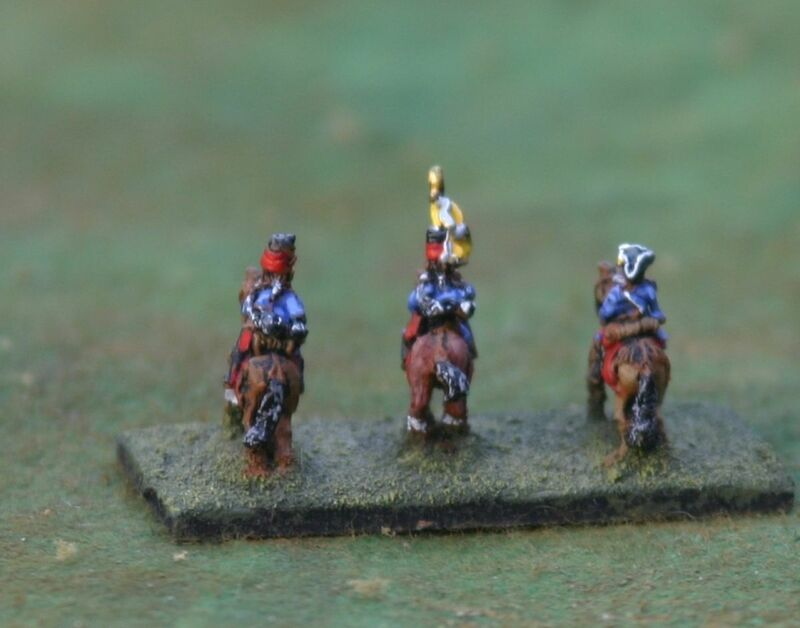 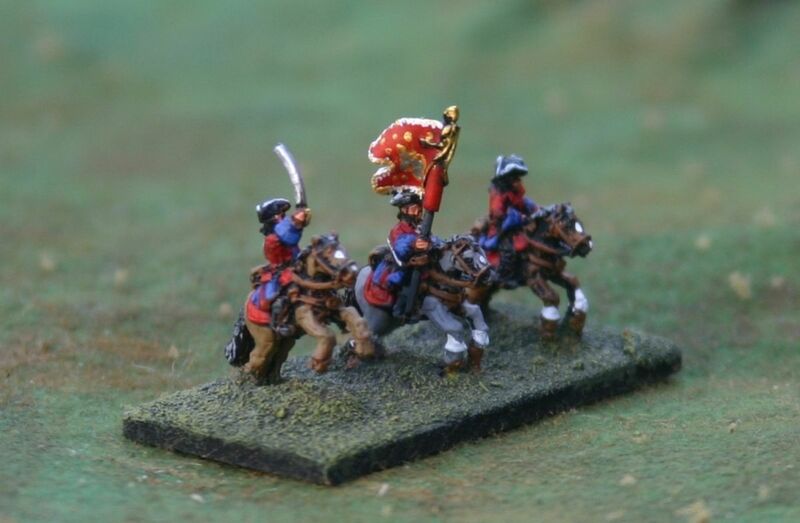 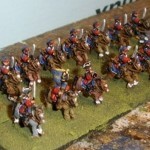 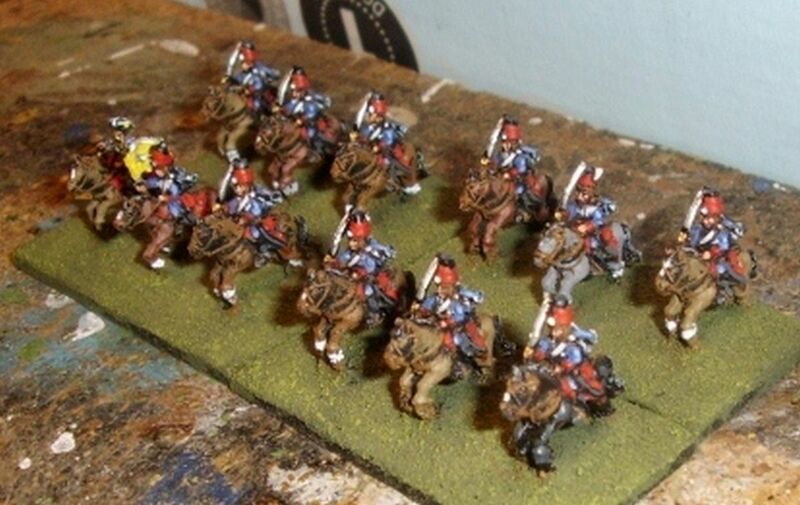 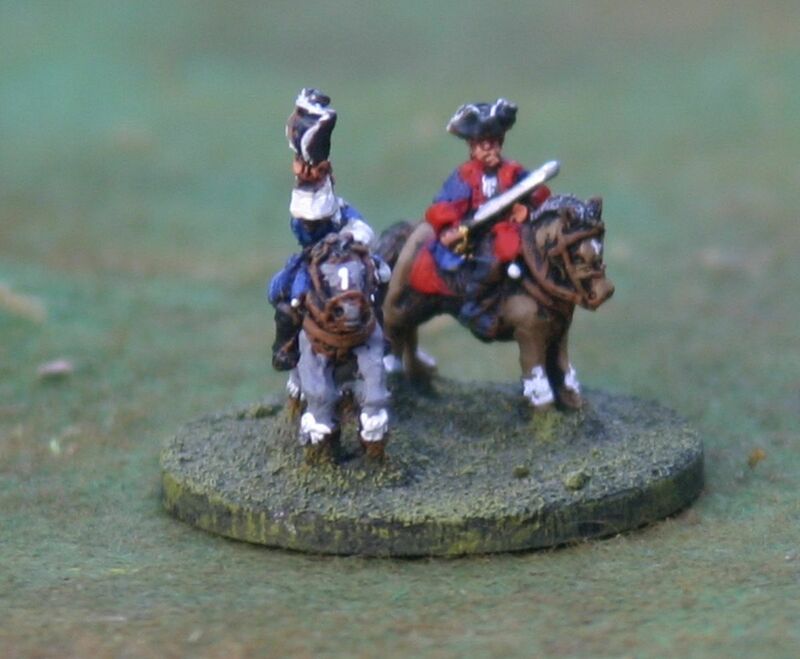 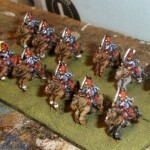 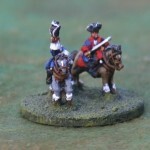 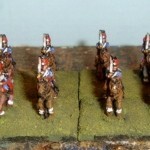 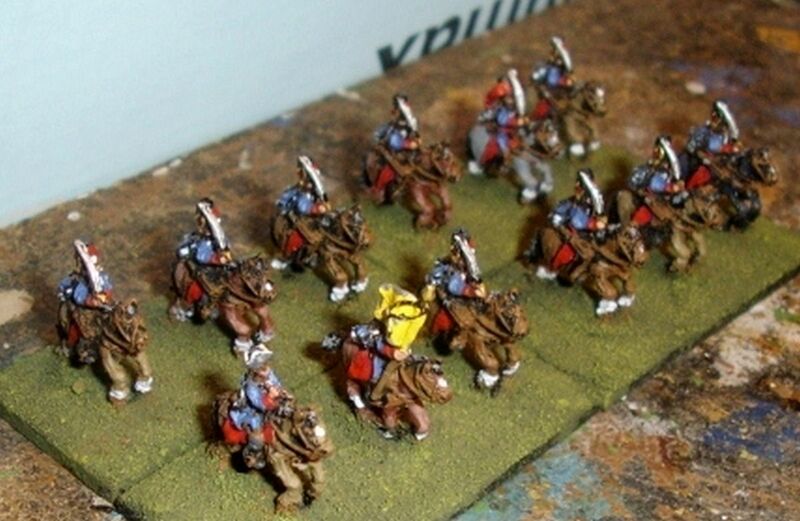 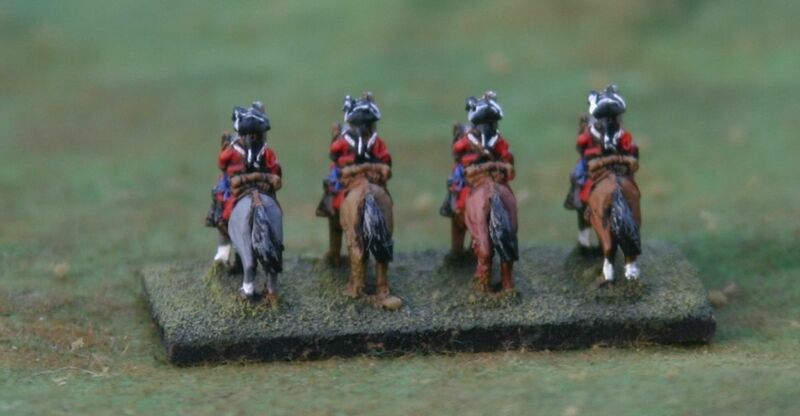 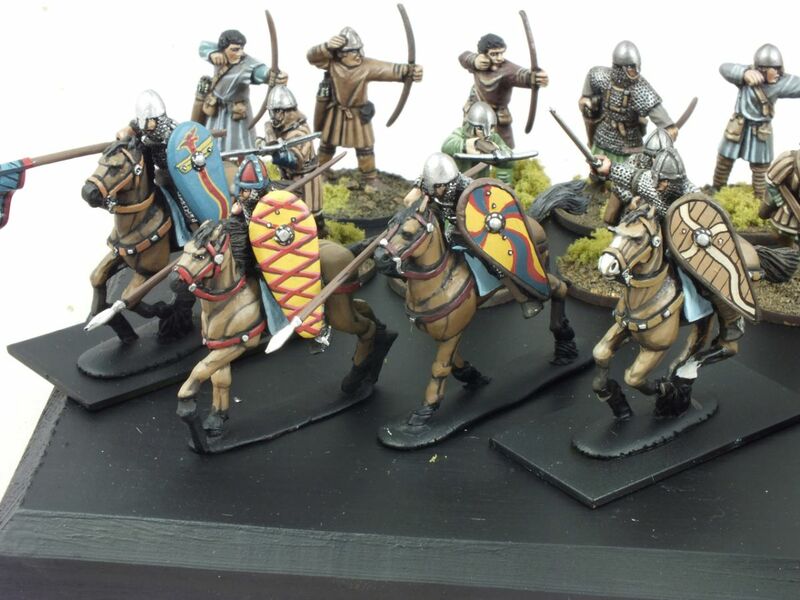 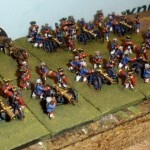 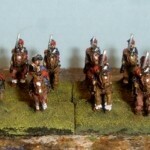 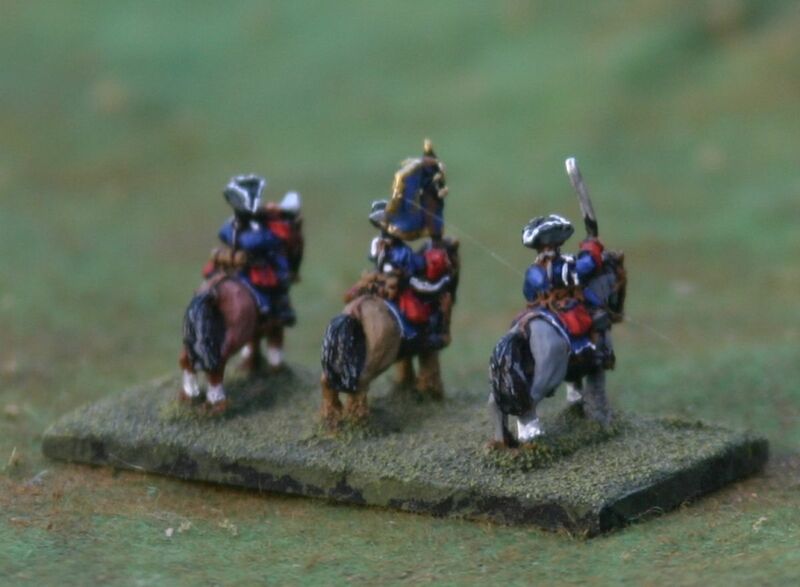 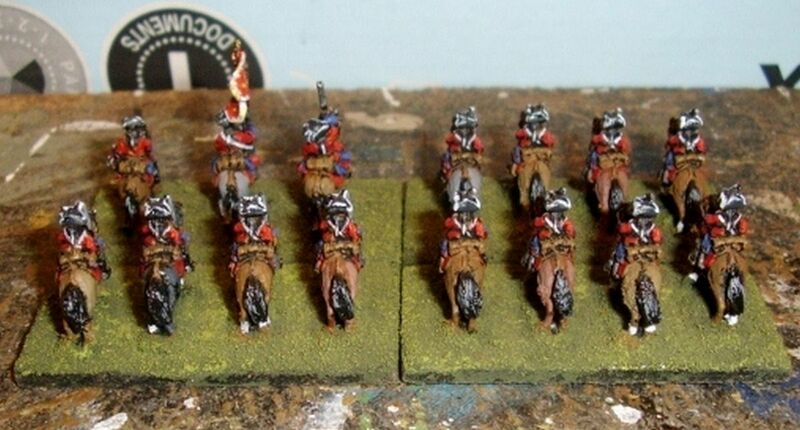 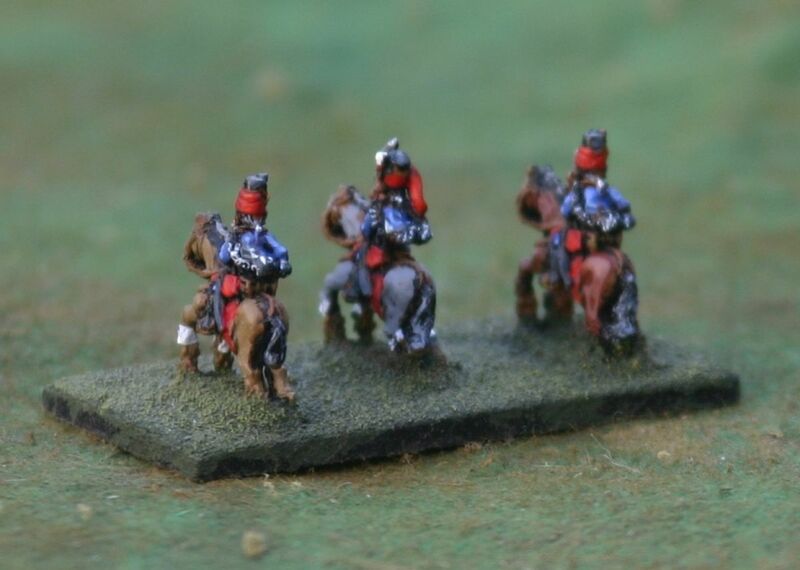 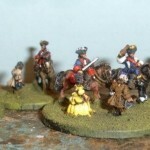 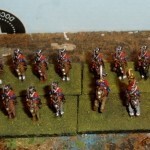 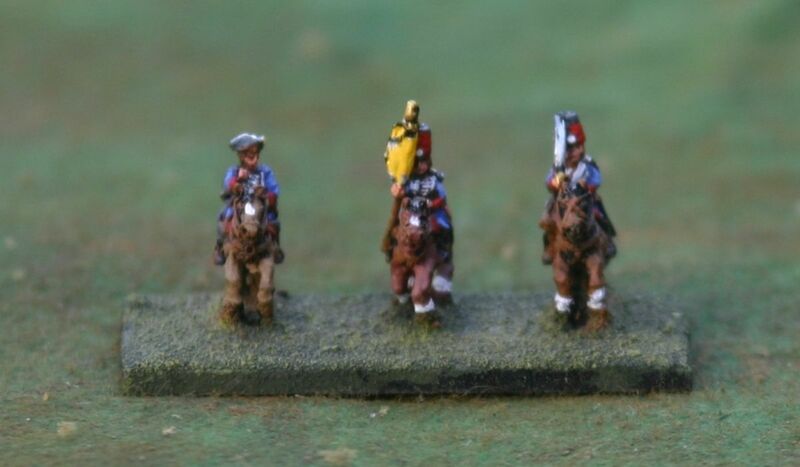 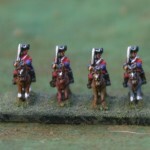 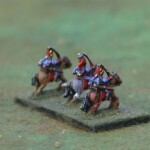 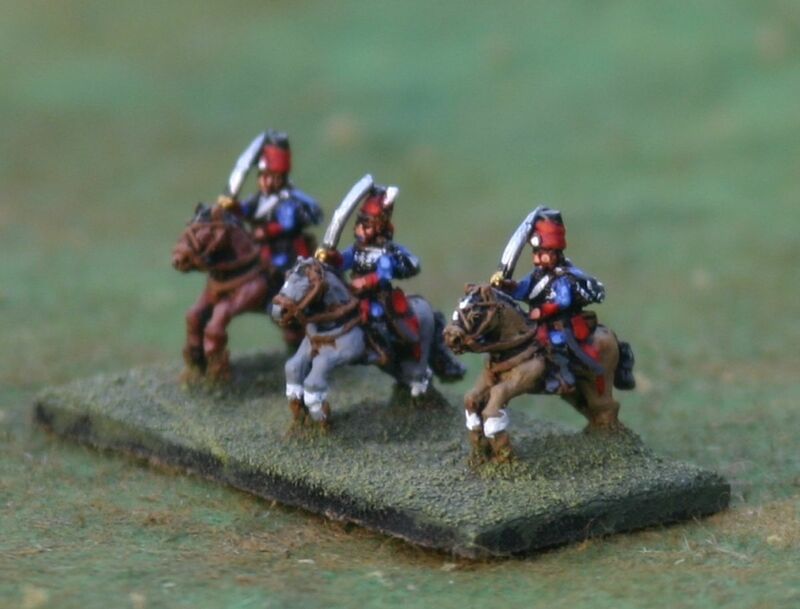 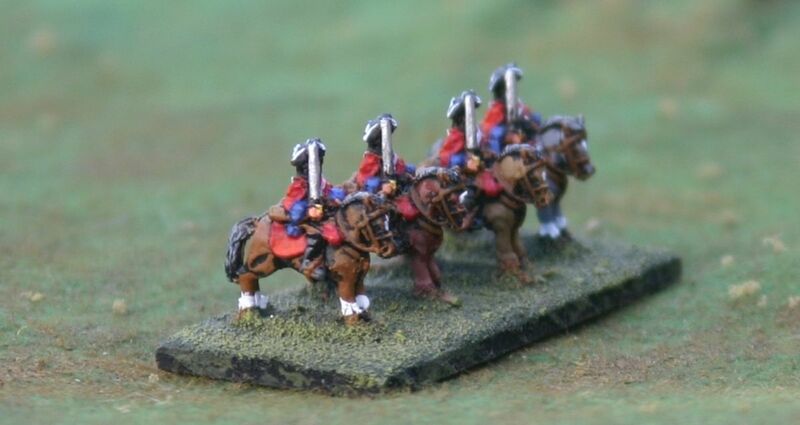 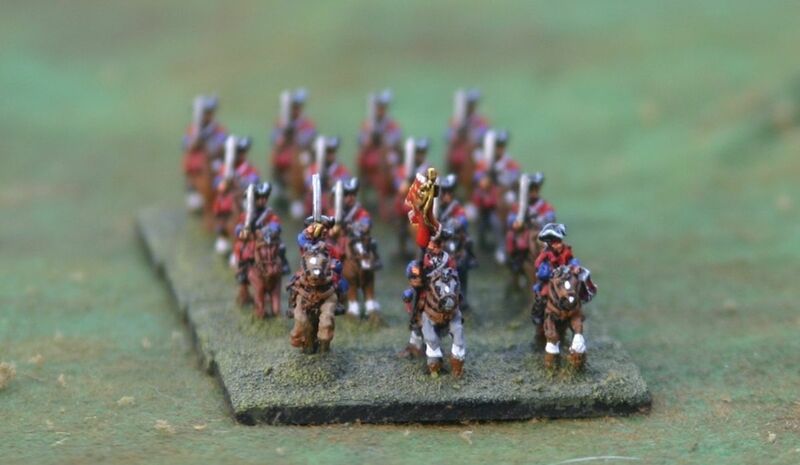 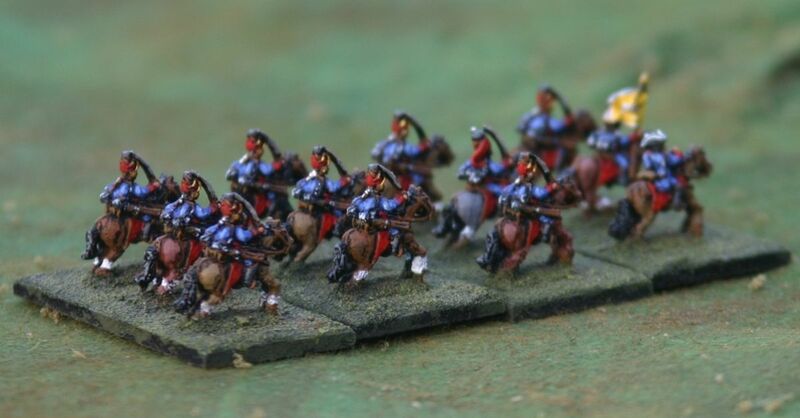 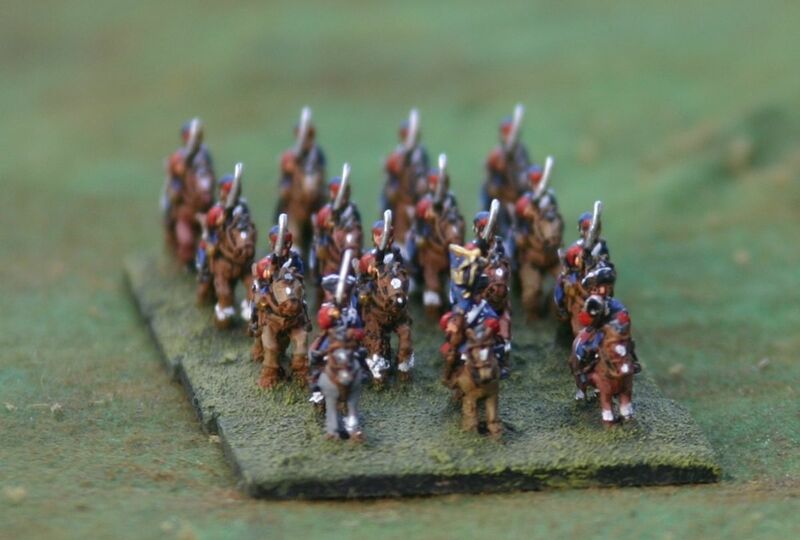 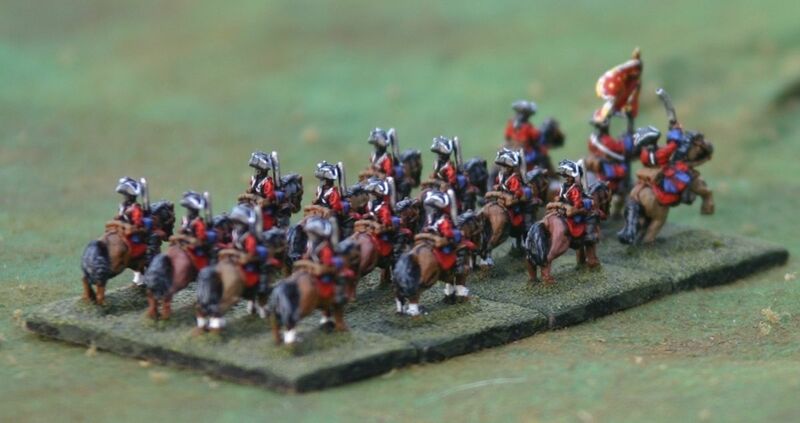 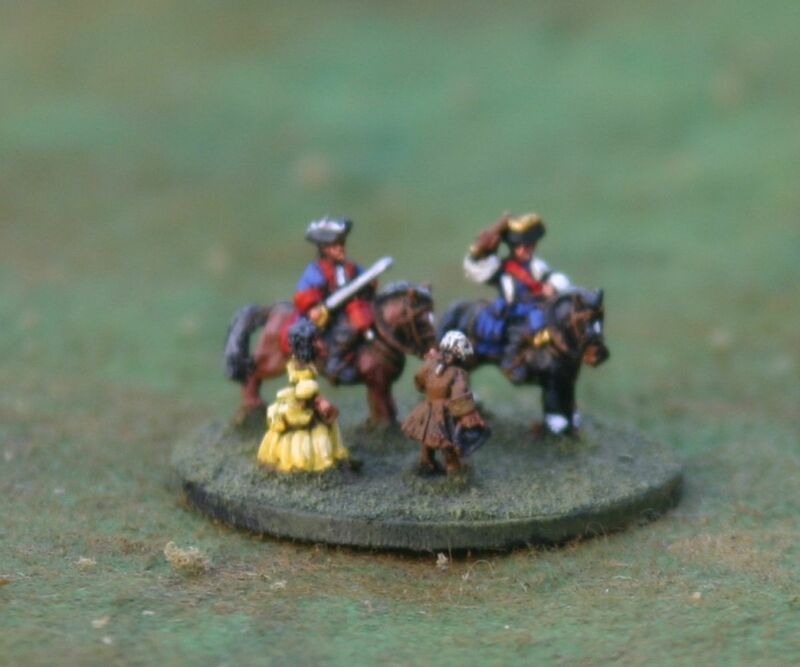 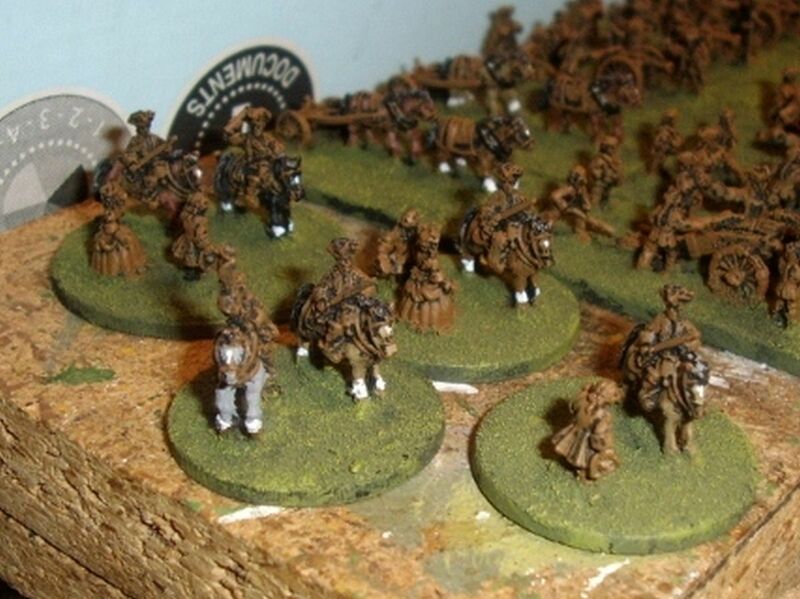 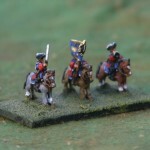 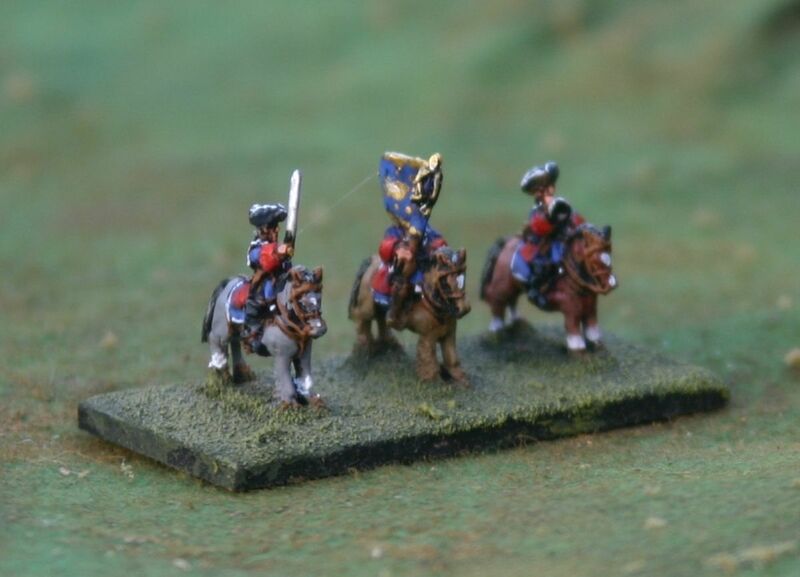 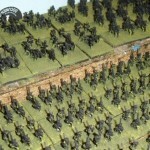 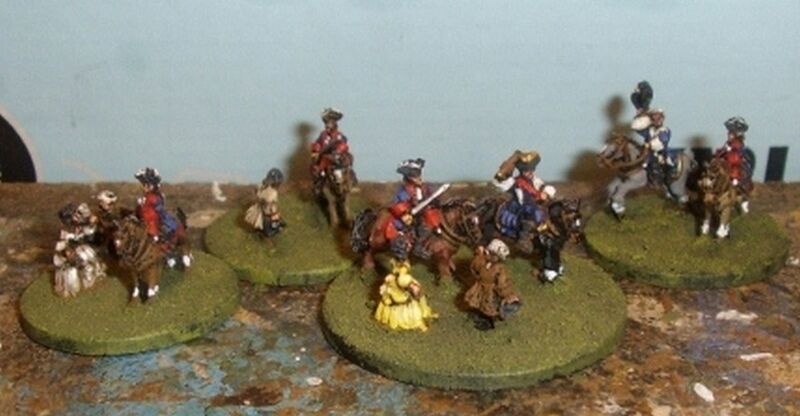 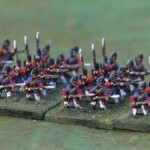 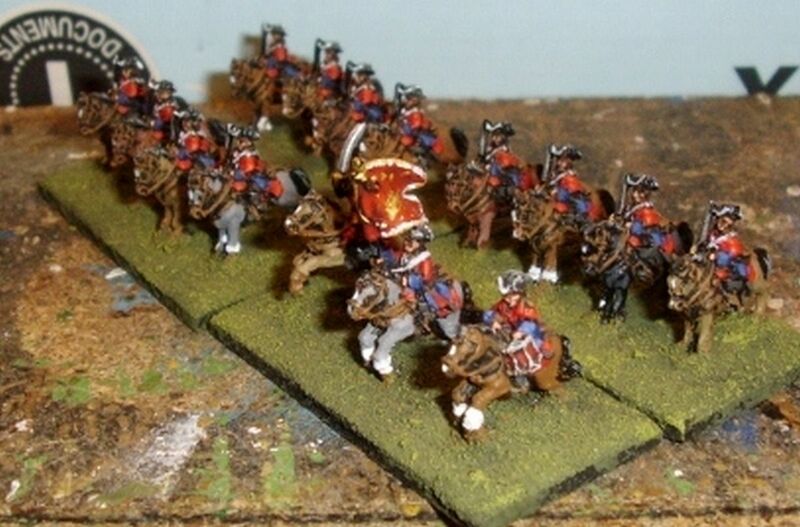 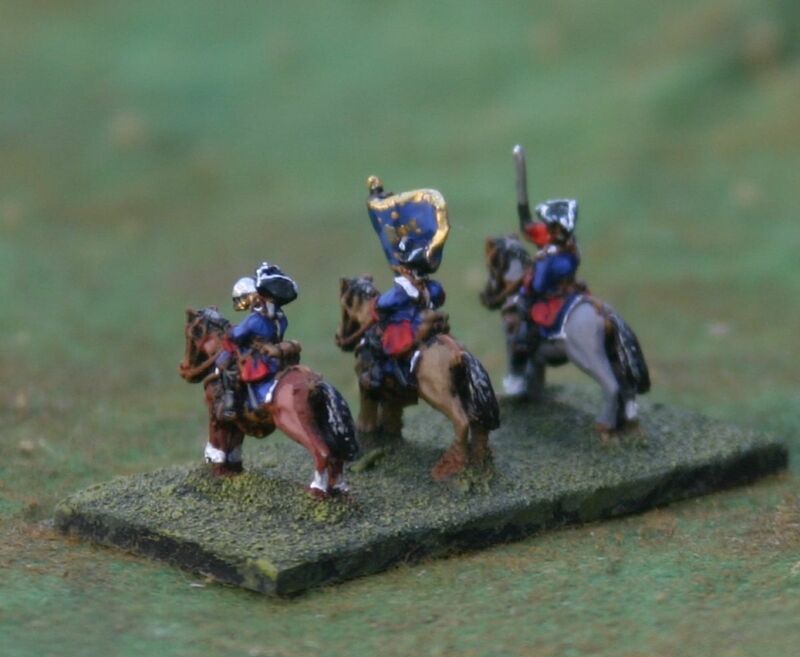 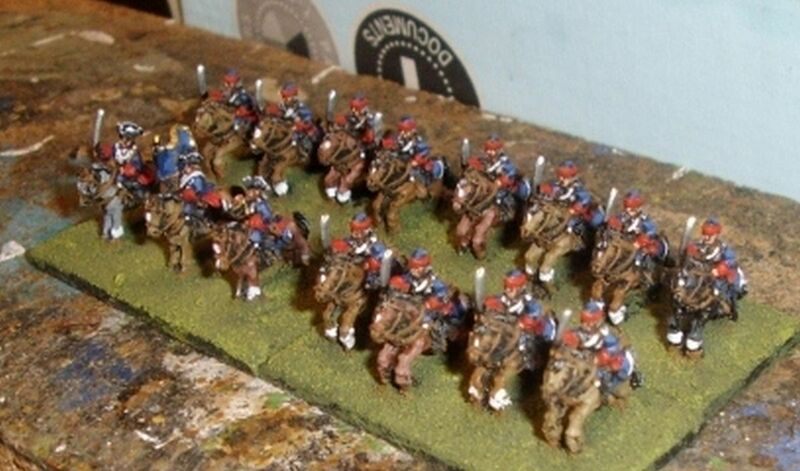 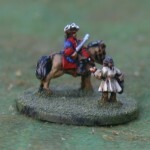 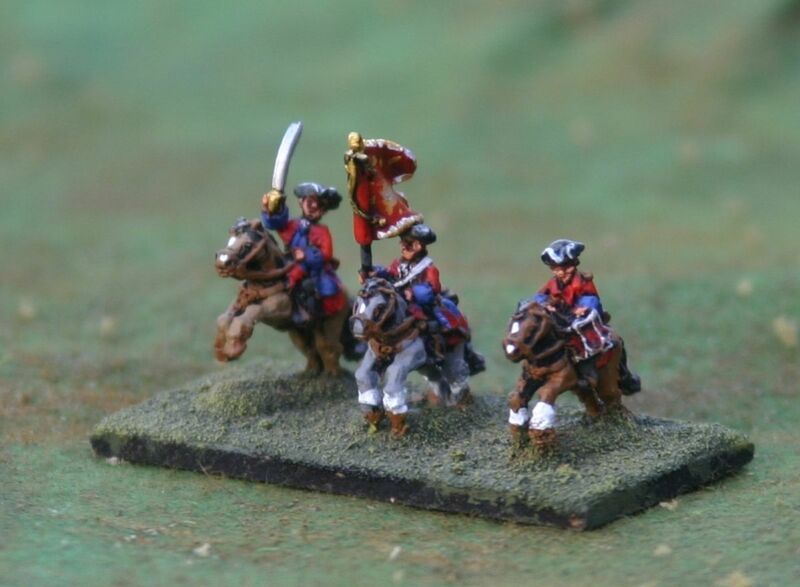 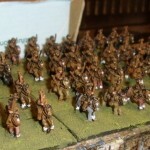 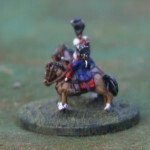 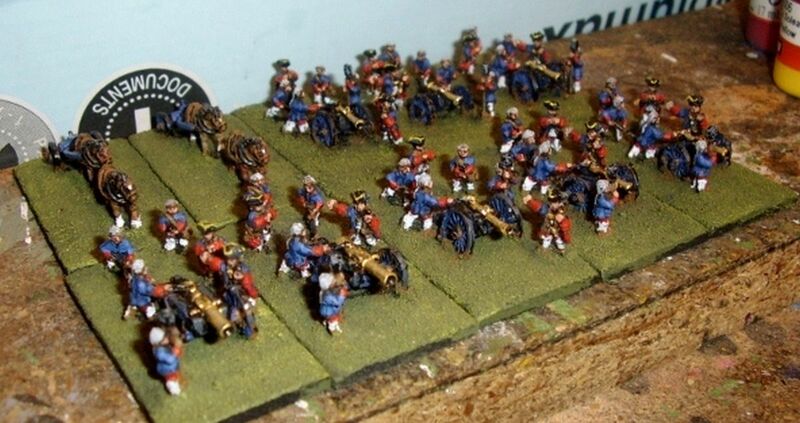 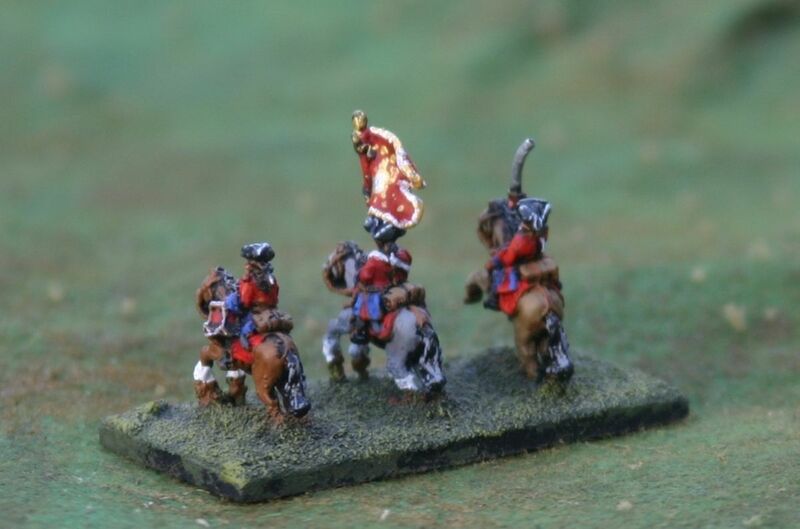 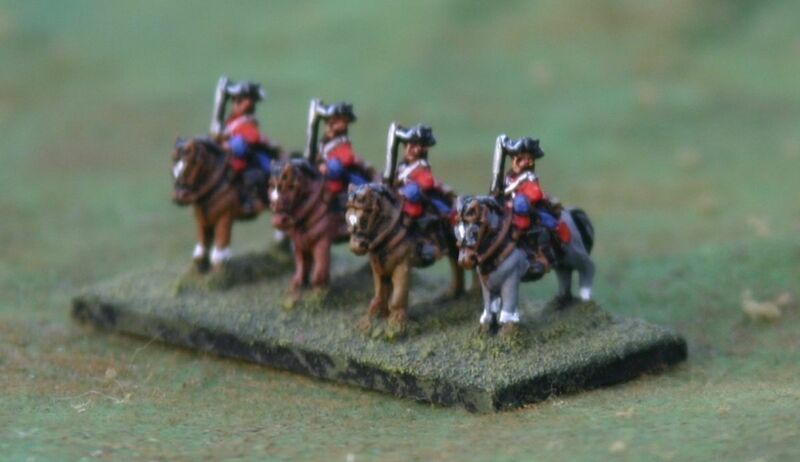 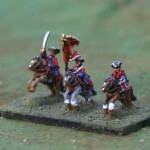 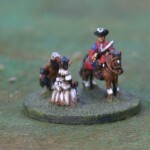 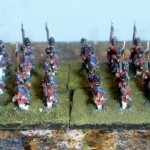 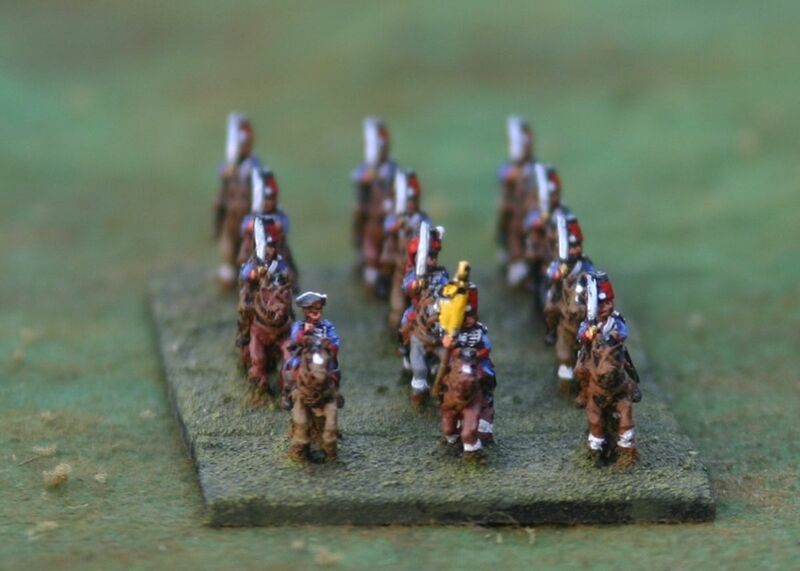 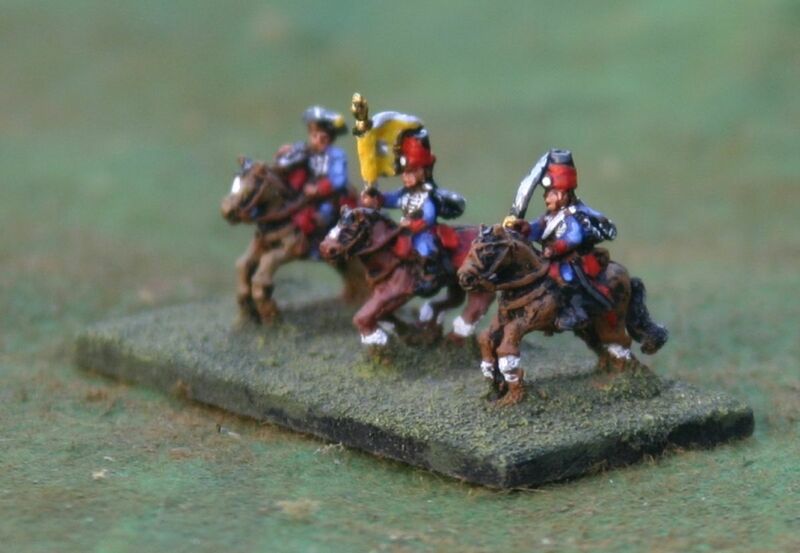 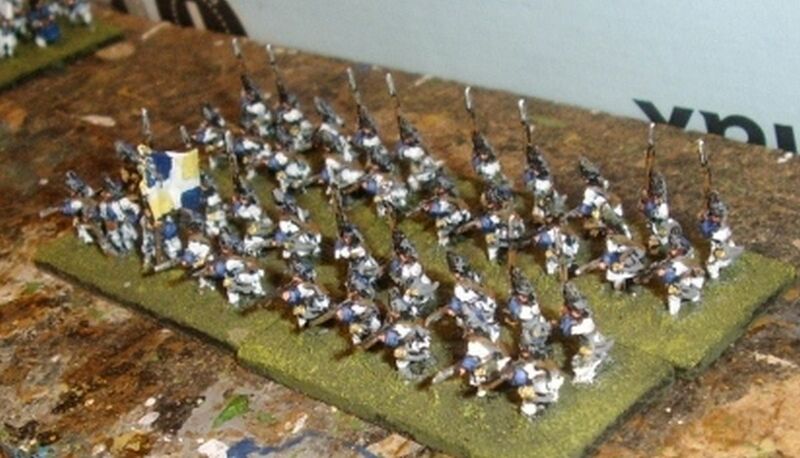 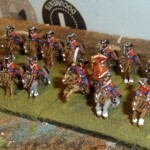 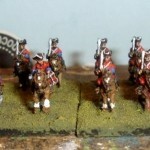 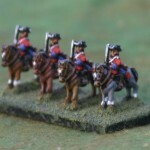 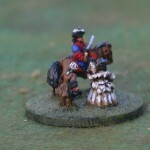 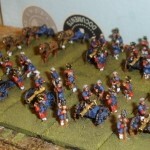 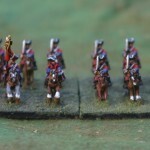 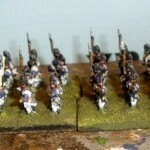 Then the sorting out into the various figure types and within that the actual troop type (ie Dragoons/Hussars). 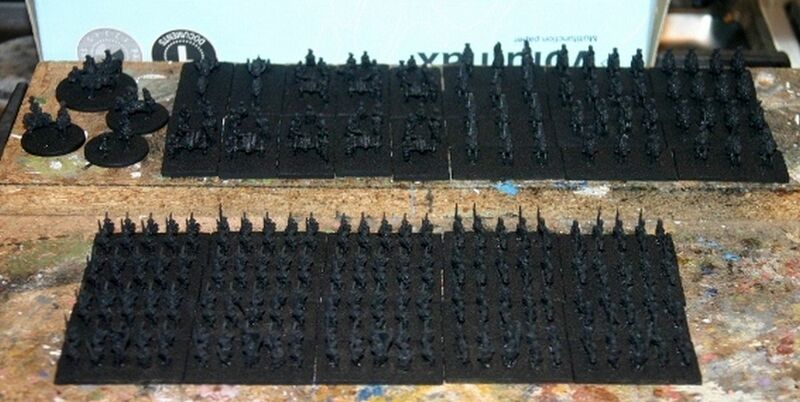 Then comes the task of gluing them to a base, adding the base material (ie sand etc) then its time to undercoat and that’s it before any painting can be done! 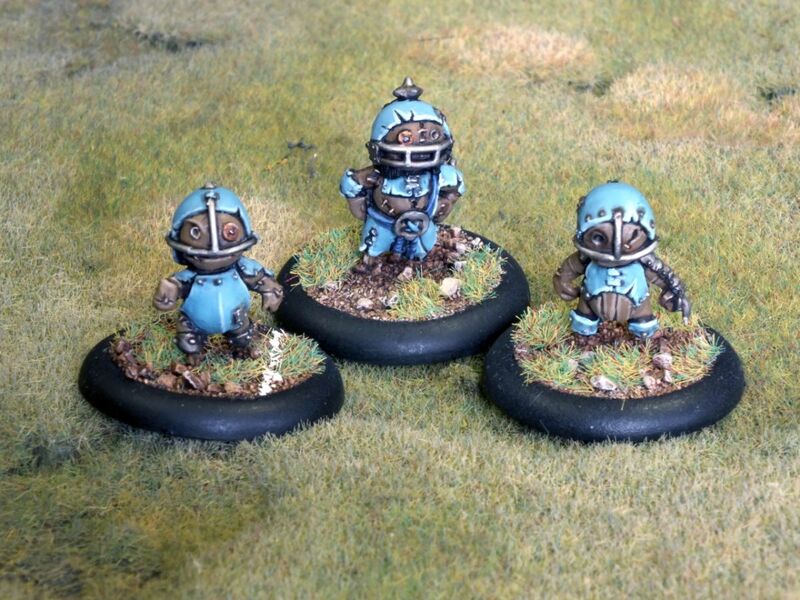 So then that’s a good start from Nik, now he’s onto the base colours. 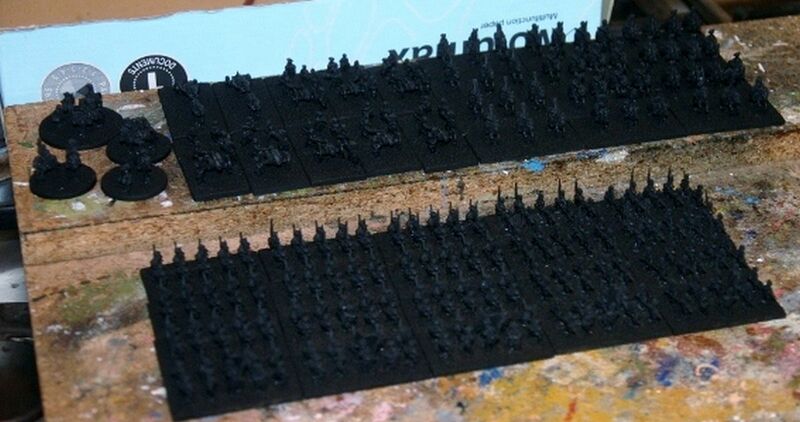 This is the stage you set the basic colours you want your figures to have. 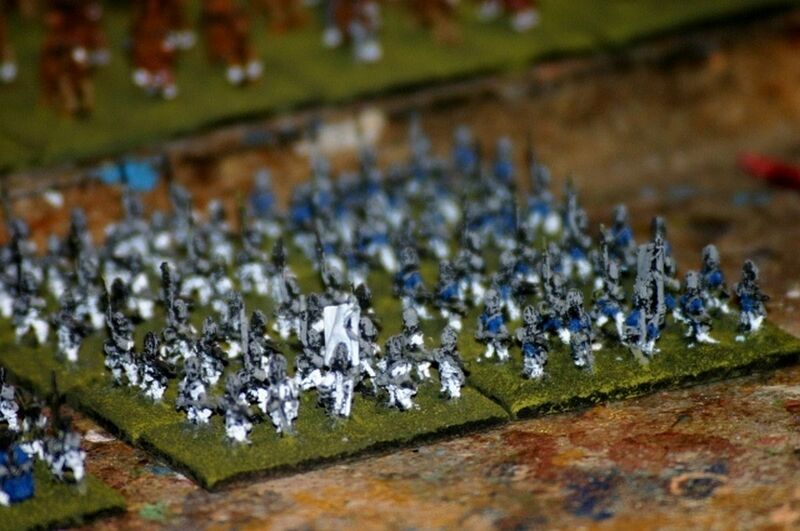 It would seem looking through these Nik does paint the base colours en masse which leads (in his words) to some ‘messy figures’. 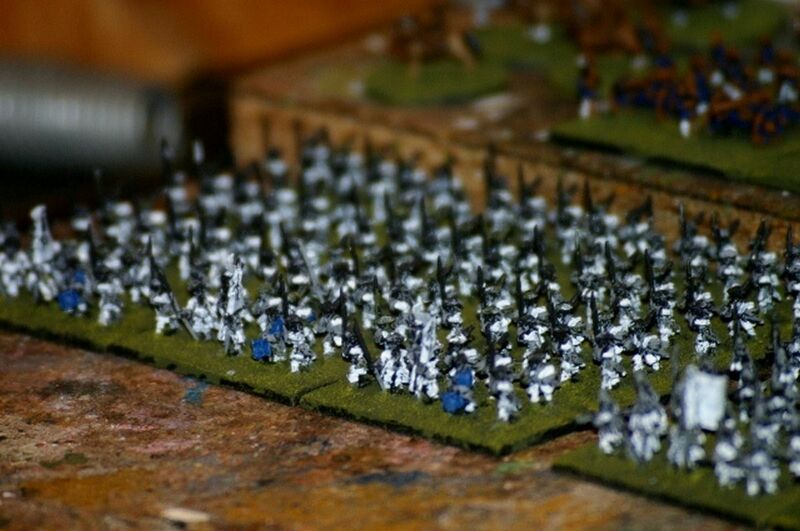 We’ve all been there (if you paint) so I know it’s just an early stage. 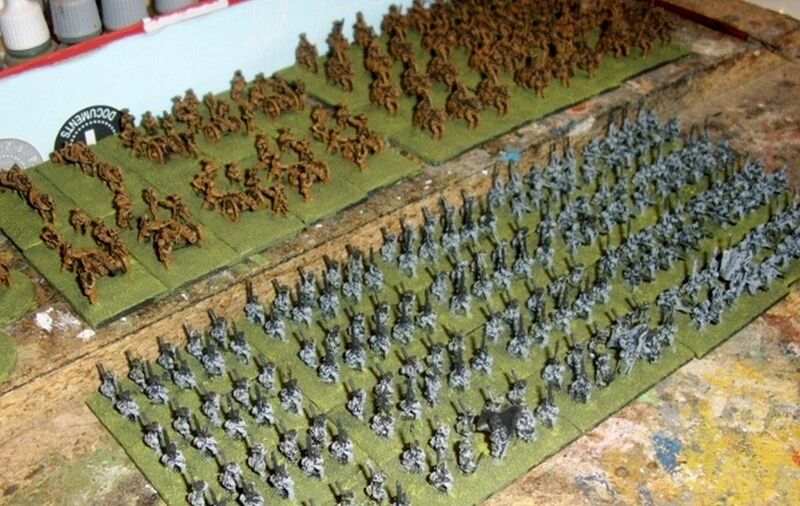 That’s it then for the base colours down, next stage of course is to paint on the basic colours. 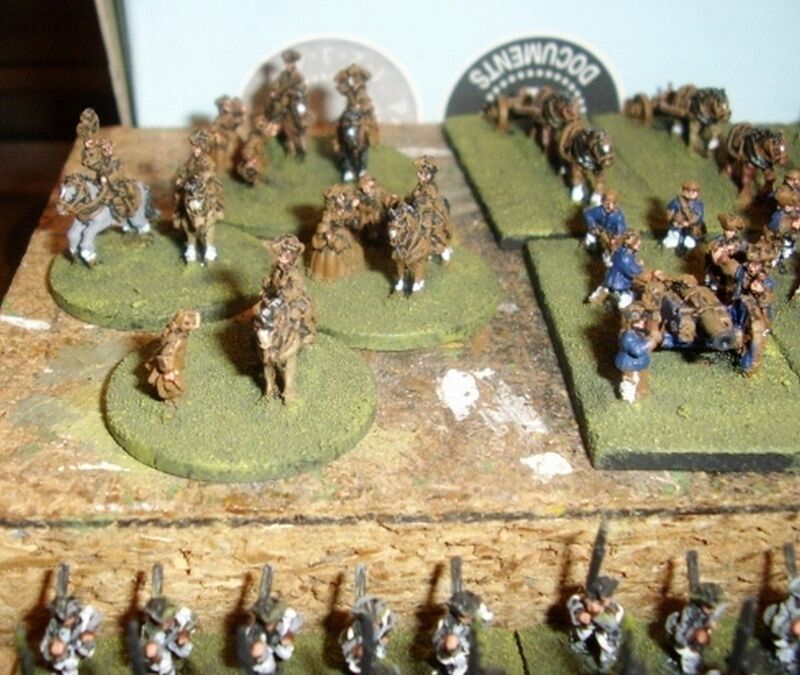 That is the basic coat, hat, rifle etc all painted in the colours that they will end up before any finishing is done. 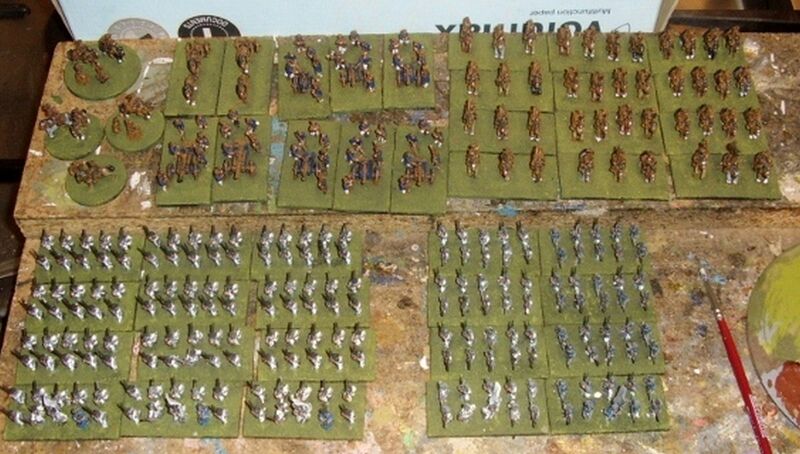 Let’s now look at the army once they’ve had their basic colours all painted. 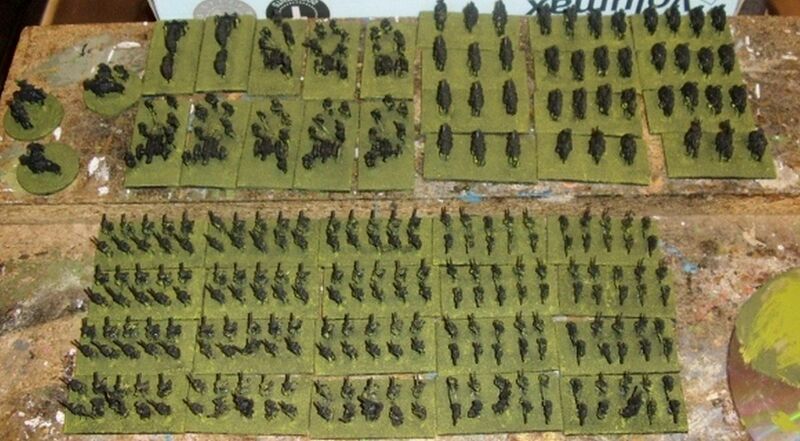 That’s a lot of figures all painted up and ready for finishing. 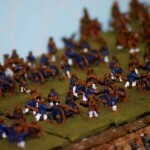 I know that Nik has finished some of them already but I think this is enough for the moment, anymore pictures and it’ll take forever to load. 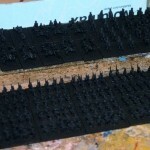 So far I’m happy with the work. 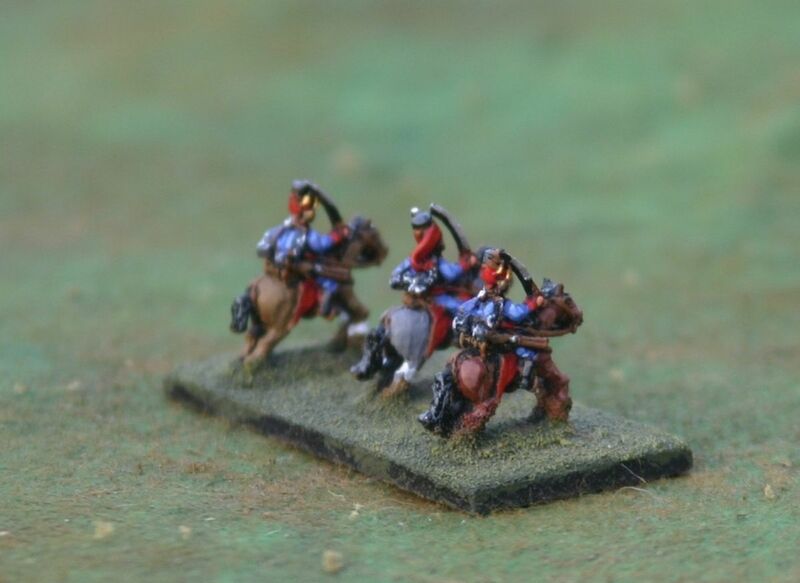 Nik appears to be doing a good job painting them. 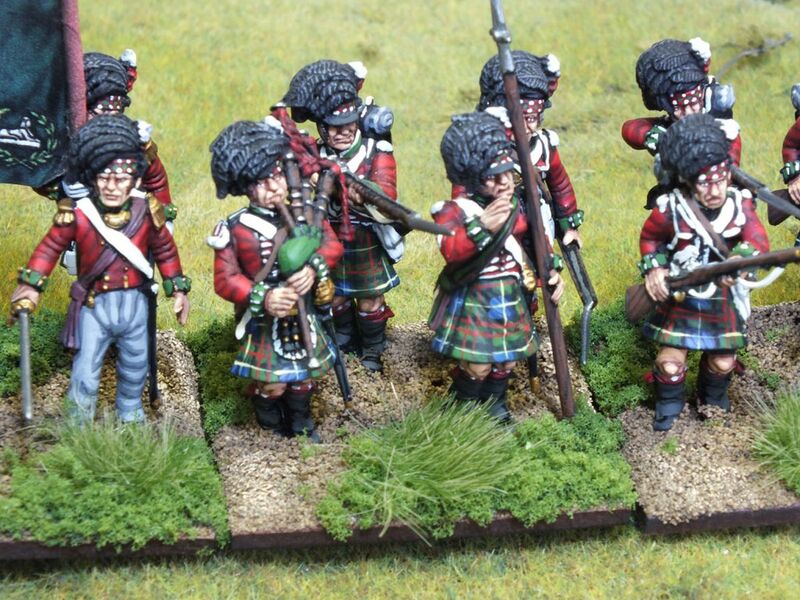 It is of course too early to tell from these what the finished troops will look like and I’m hoping the finish troops will be here in a few weeks so I can see! 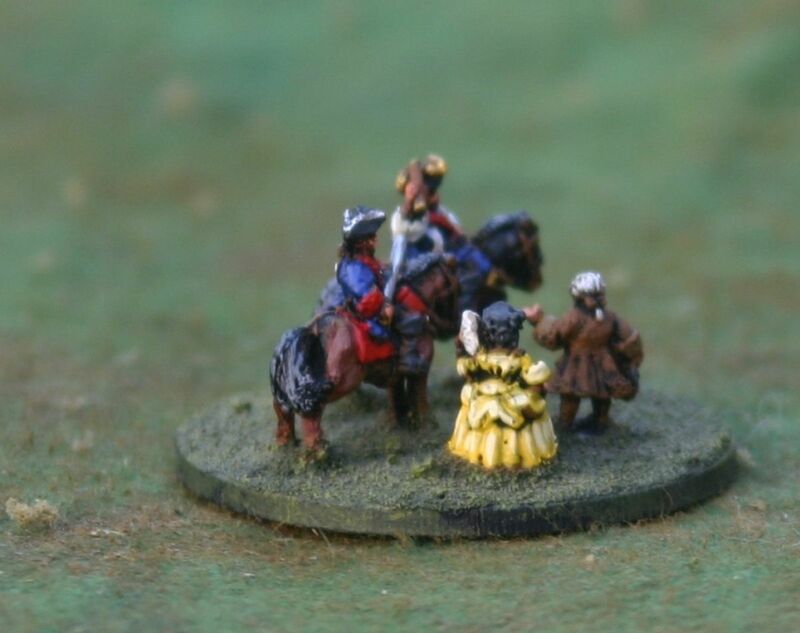 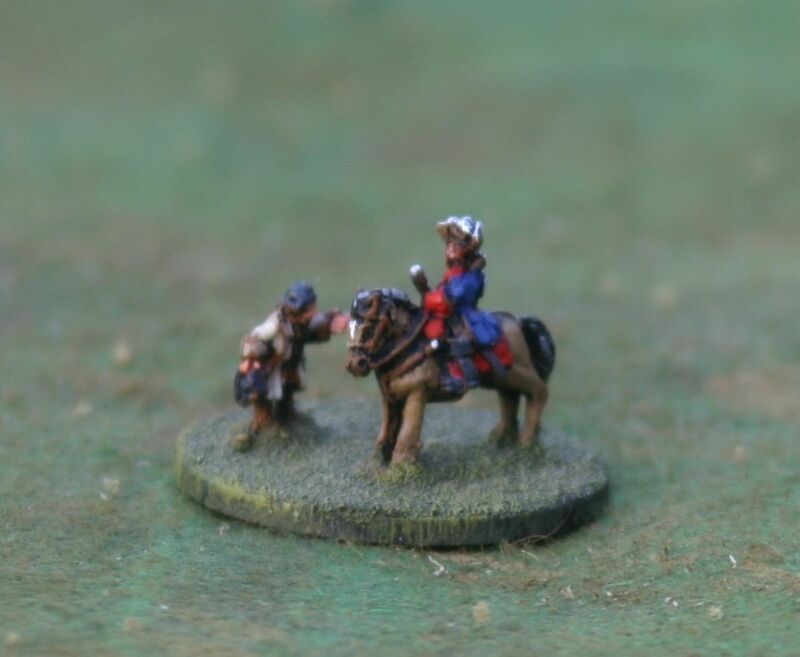 But so far I’d say that if you want 10mm figures Nik seems to be a great choice for a commission painter!